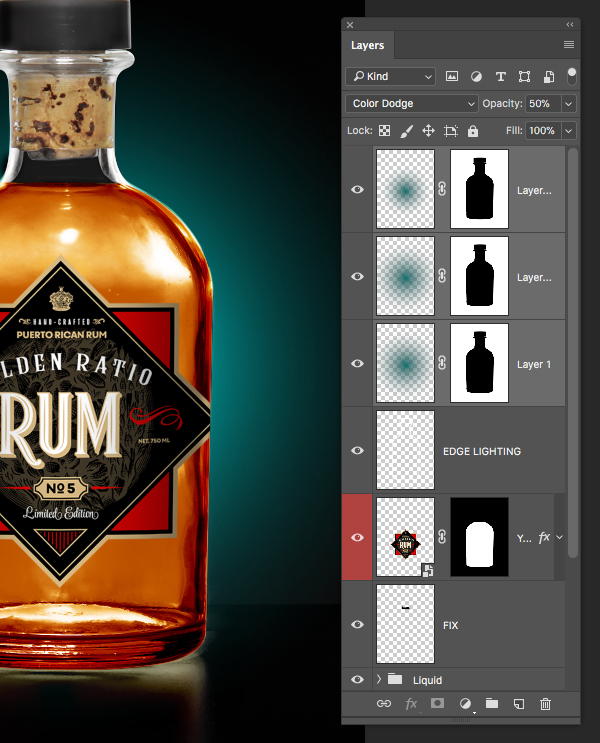 Today we will be designing a rum label for a realistic bottle mockup in Photoshop. We will be using a few of the typefaces from The Complete, Quality Font Collection to demonstrate the versatility and flexibility of the typefaces. 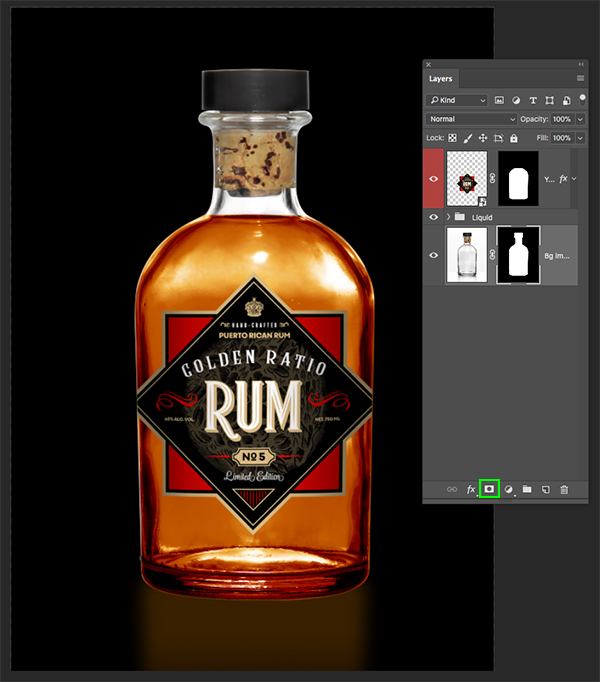 We will then apply our label design to a realistic bottle mockup to take it one step further. 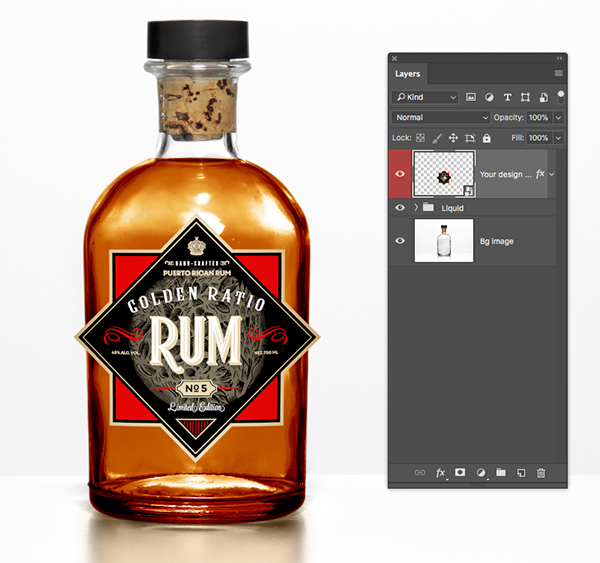 If you are ready to get started on the label design then fire up Photoshop and we will begin! This freebie pack includes font styles from Letritas, Los Andes Type and TypeSETit! The freebie pack is just a small sample of the resources available in The Complete, Quality Font Collection for just $29 (that’s 99% off). This bundle contains some of the world’s greatest fonts, from a select group of hugely respected type foundries, all in a limited time collection! Please note that unfortunately we are no longer able to provide the Rumble Font weights by Alit Designs from March 20th, 2018. 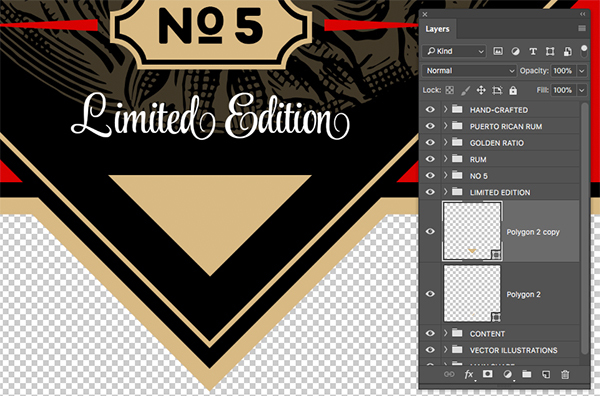 These were initially included in the freebie pack but only for the duration of the bundle run. We apologise for any inconvenience caused. 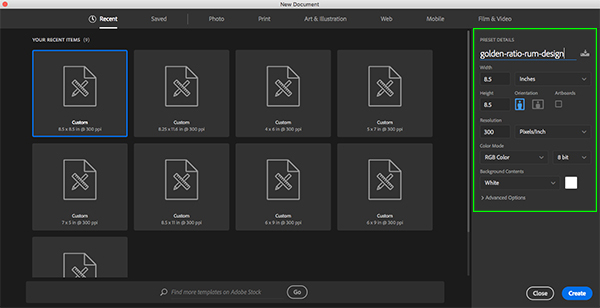 To begin, let’s start Photoshop and create a New Document. 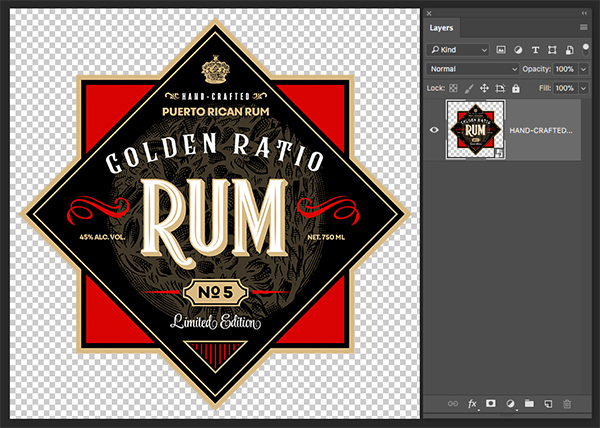 The first thing we want to do is give our file a name – here I will be using ‘golden-ratio-rum-design’. From here let’s make the size of our document an 8.5” x 8.5” square in ‘RGB’ with a ‘Resolution’ of ‘300 ppi’. 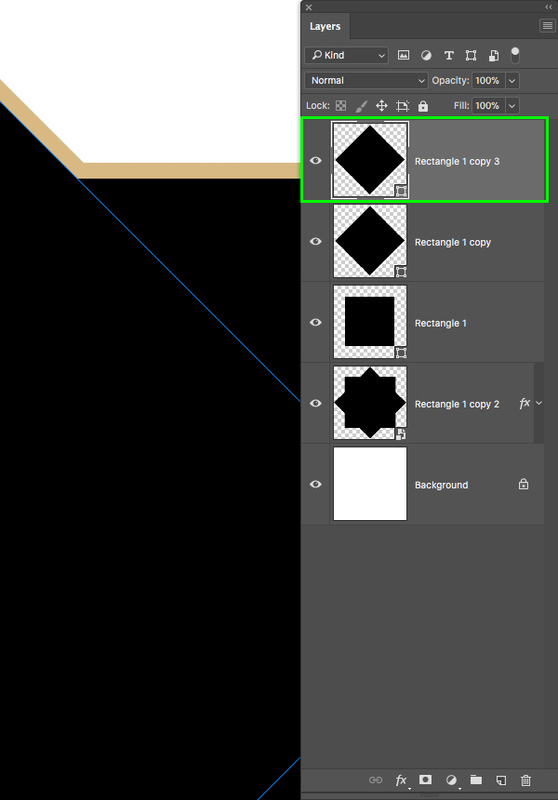 For now we can leave the ‘Background Contents’ set to ‘White’ and then ‘8 bit’ for the image before clicking ‘Create’ in the lower right corner. 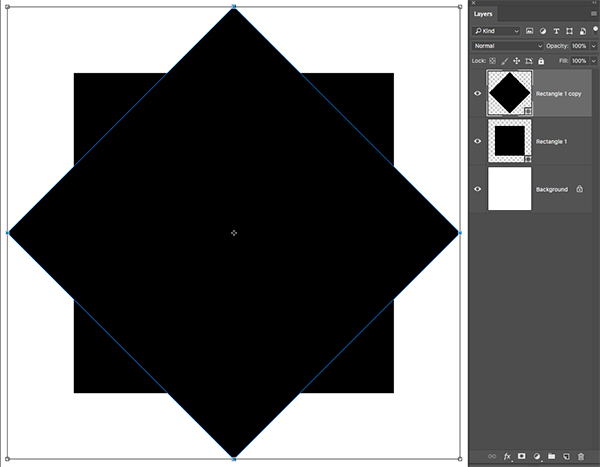 From here, hold the Shift Key and click and drag out a black square in the middle of your canvas. Holding the Shift Key will ensure that we constrain the proportions so that the shape is even on all four sides. 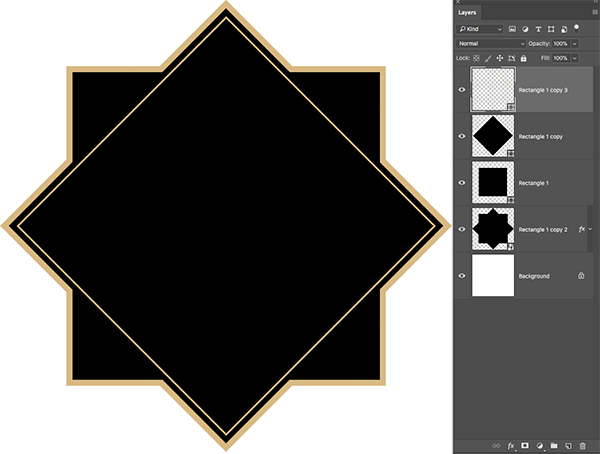 Next, select the top diamond shape, hold the Shift Key, and then click on the black square below so that both shapes are selected at the same time. You will now have a merged Smart Object with the new copies of each of the original two shapes. 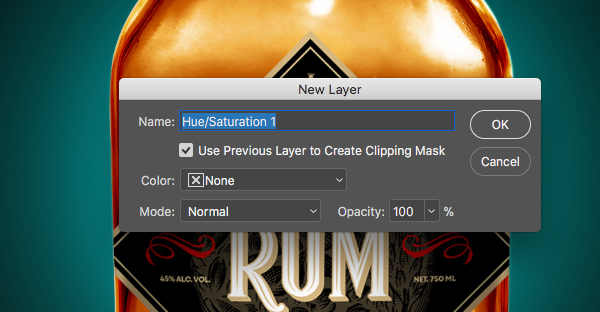 Let’s now double click on the Smart Object layer to bring up the Layer Style panel and check off the ‘Color Overlay’ option. For the fill color we will enter the hex value ‘#D8B983’ before pressing ‘OK’ twice to apply the changes and close out of both dialog boxes. After applying the color change you won’t notice anything different right away, and that is because we need to make the Smart Object shape in the back larger. To do this, press Command/Ctrl+T and then hold the Alt/Option+Shift keys while dragging outwards from any of the four corners of the bounding box to scale it up from the center. 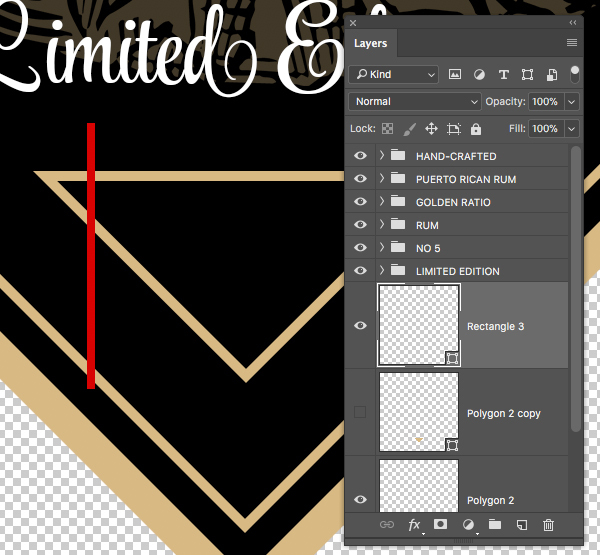 Doing this will reveal the gold colored border which is really just a solid shape behind our original two shapes. 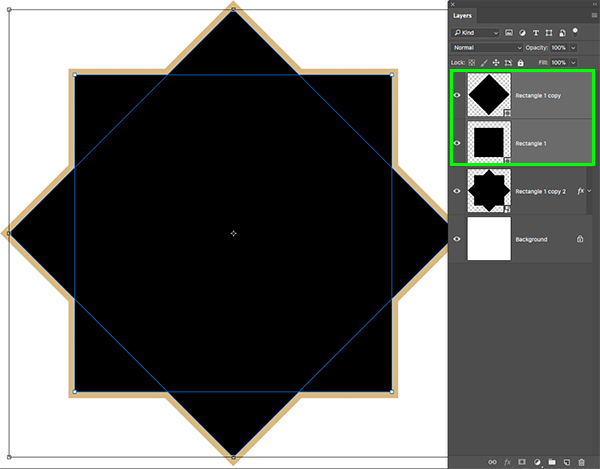 Next, select the top black diamond shape and press Command/Ctrl+J to duplicate the layer. Press ‘U’ once again to get the Rectangle Tool and now let’s change the ‘Fill’ to empty by selecting the white box with the red strike through it. 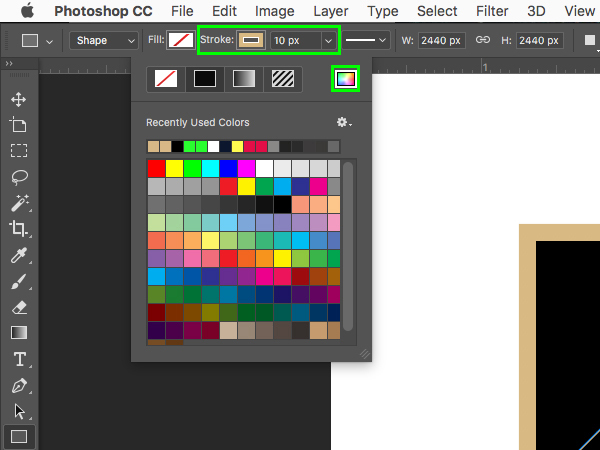 Instead of using the fill here we will use the ‘Stroke’ option so let’s first change the value to ’10px’ and then click on the color box just to the right to reveal our color panel. 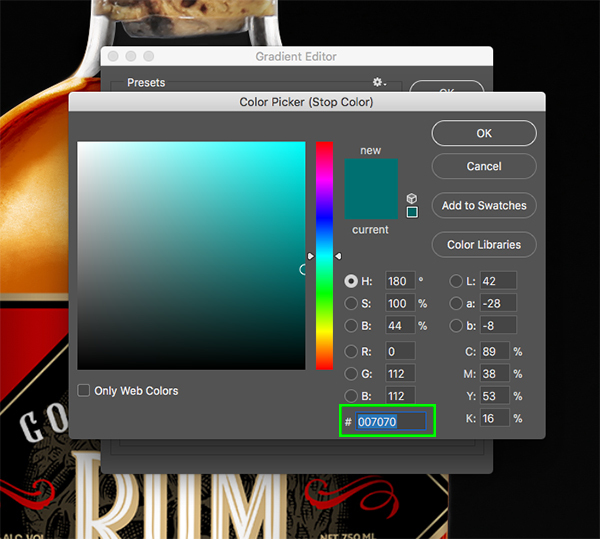 Once this popup appears you can click on the color spectrum icon in the upper right corner of the panel to enter a color value manually. 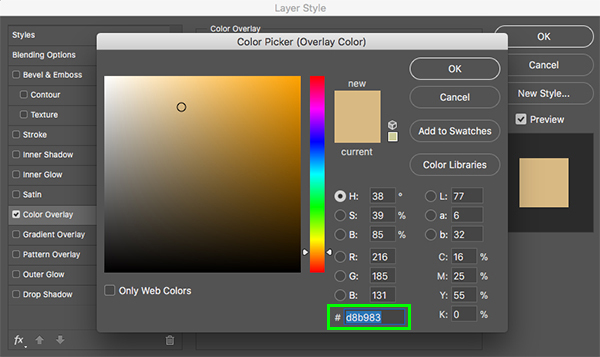 For this we will use the same gold color that we used in the previous step by entering the hex value ‘#D8B983’ and then pressing ‘OK’ to close out. 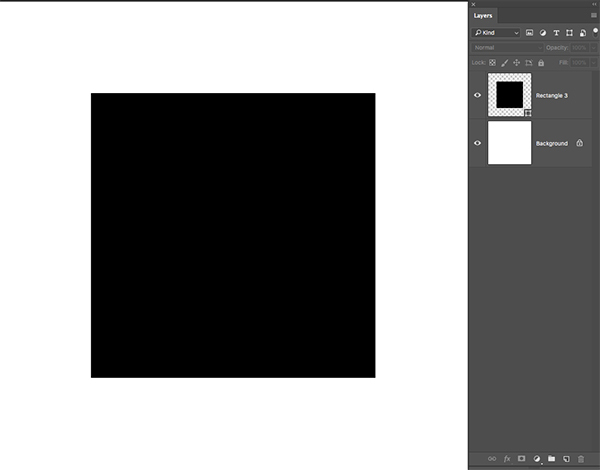 Next, select the copy of original black square – ‘Rectangle 1 copy 4’ in the Layers Palette. 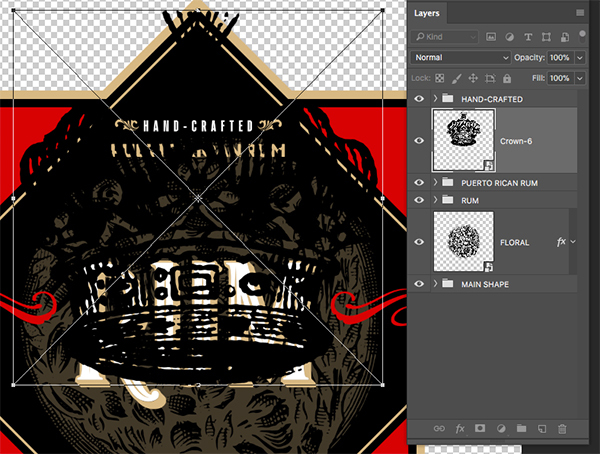 From here, press Command/Ctrl+J to duplicate the layer. Press ‘U’ and modify the settings so you have no stroke and a solid fill color. 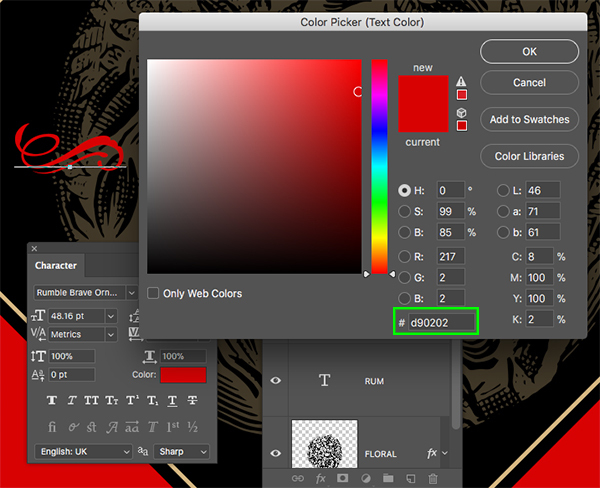 Click on the color spectrum icon and enter the hex value ‘#D90202’ and then click ‘OK’ to apply the changes. 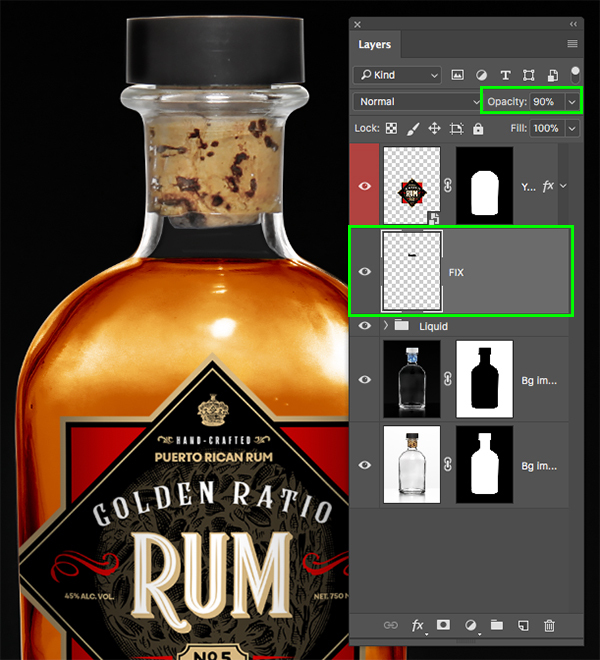 We will now select the very top layer, hold the Shift Key, and then click on the merged Smart Object shape at the bottom so that all of our shapes and layers are selected except for the locked ‘Background’ layer. 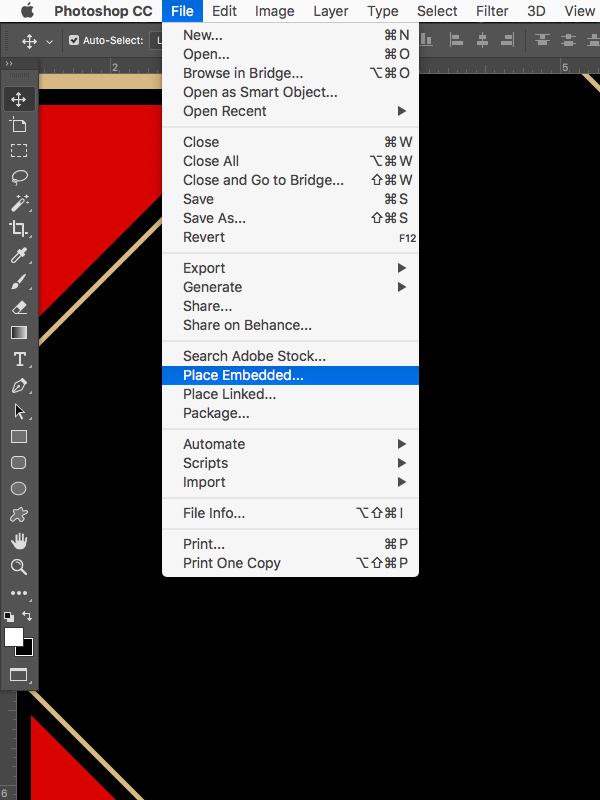 Next, go to the ‘File’ menu and choose ‘Place Embedded…’ from the menu. 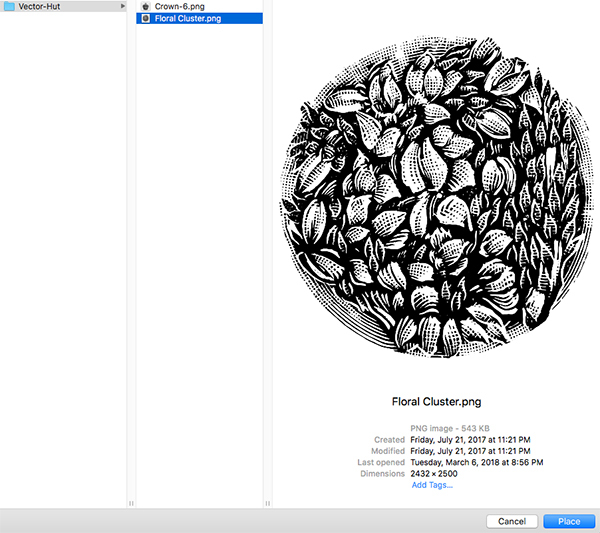 I will be using a flower cluster from one of the previous bundles from Design Cuts called ‘The Ultimate Vector Bundle’. If you have purchased this bundle, you can navigate to the Vector Hut folder and choose the file called ‘Floral Cluster.png’, otherwise you can use any other resources you have available. 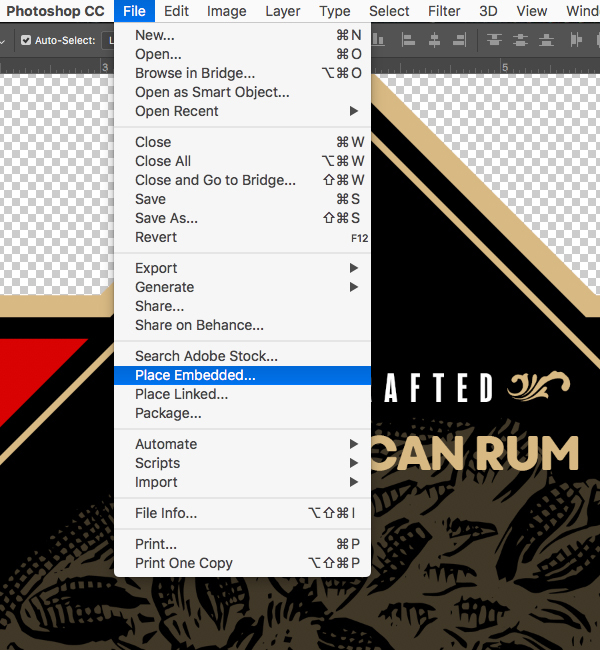 Once you have selected your file choose ‘Place’ from the lower right. 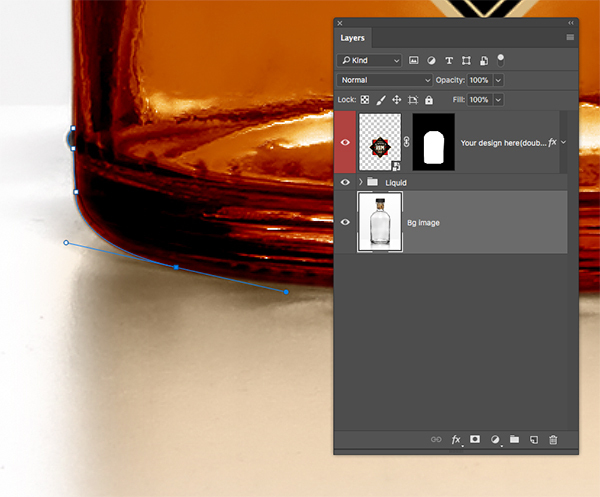 Once the illustration is imported it will automatically be brought in as a Smart Object with the file name. Press ‘Return’ on the keyboard to place the file. 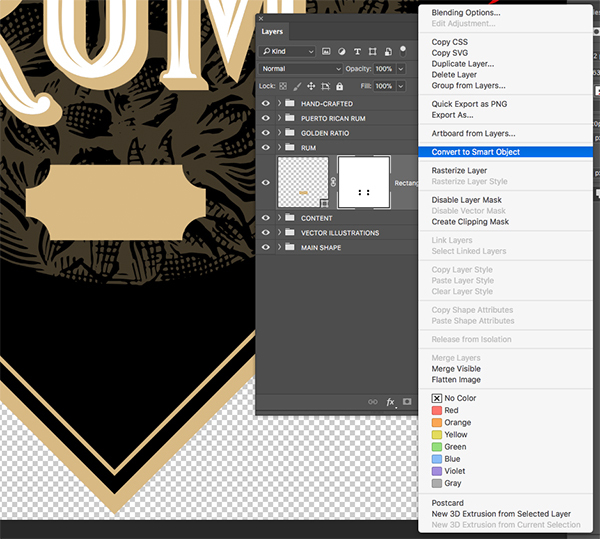 Double click on the layer to open the Layer Style panel and check off the ‘Color Overlay’ option. 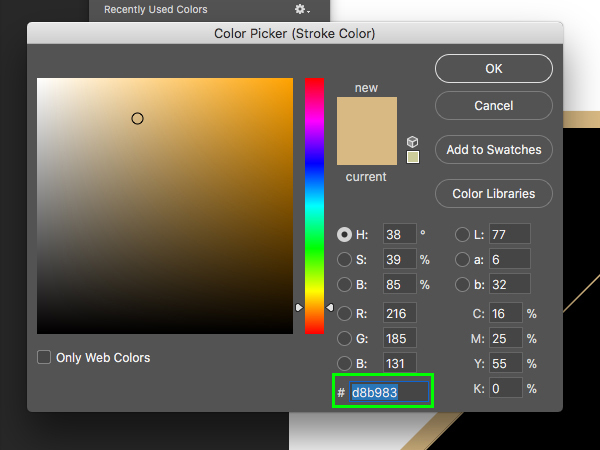 Next, enter the hex value ‘#D8B983’ that we used earlier for our gold color. Once you have done that, press ‘OK’ twice to apply the changes and close out of both dialog boxes. 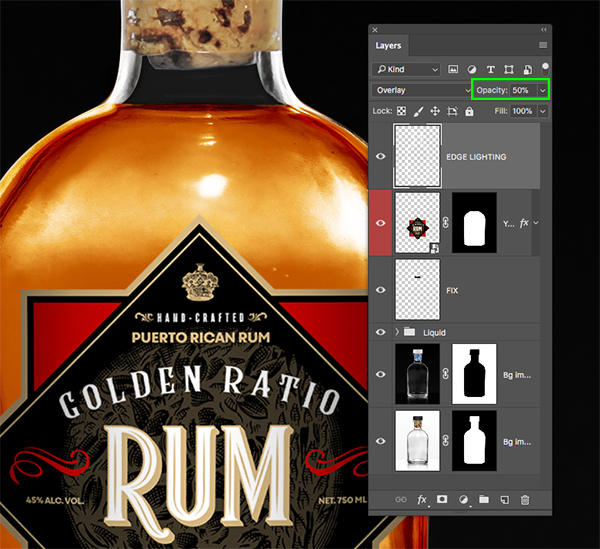 Create a new layer at the top of your Layers Palette by either clicking on the ‘Create a new layer’ icon next to the trash bin or by using the keyboard shortcut Command/Ctrl+Alt/Option+Shift+N on the keyboard. 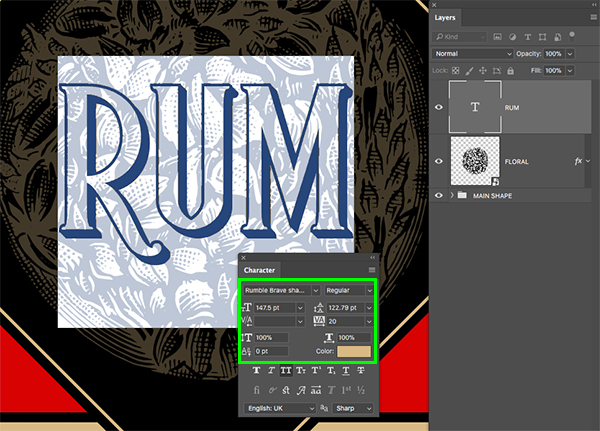 Once you have done that, switch to your Type Tool (T) and type out the word ‘Rum’ with an uppercase ‘R’ and lowercase ‘U’ and ‘M’. 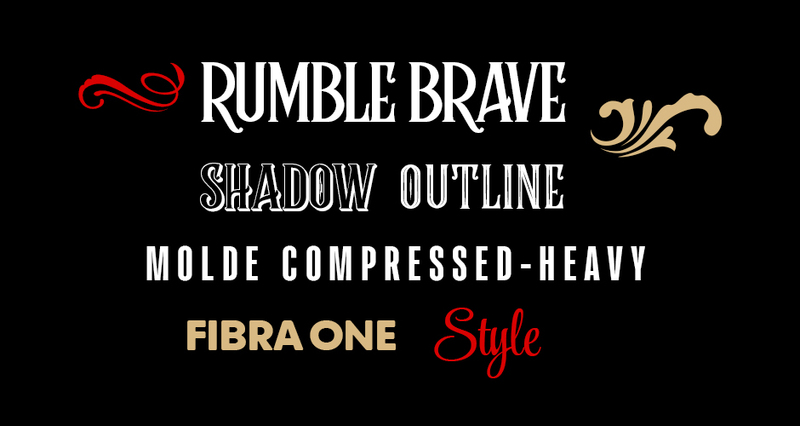 For the font I am using ‘Rumble Brave’ with the ‘Shadow 3D’ style from ‘Alit Design’. 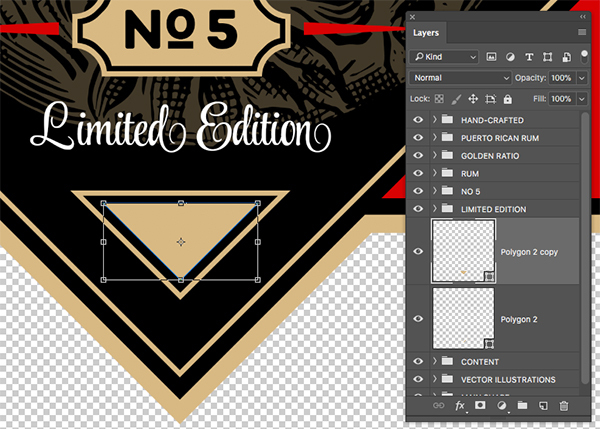 If you don’t have access to this typeface, any other vintage font with a shadow or 3D style will be sufficient. Let’s open our Character Panel by going to the Window menu and choosing ‘Character’ from the list. 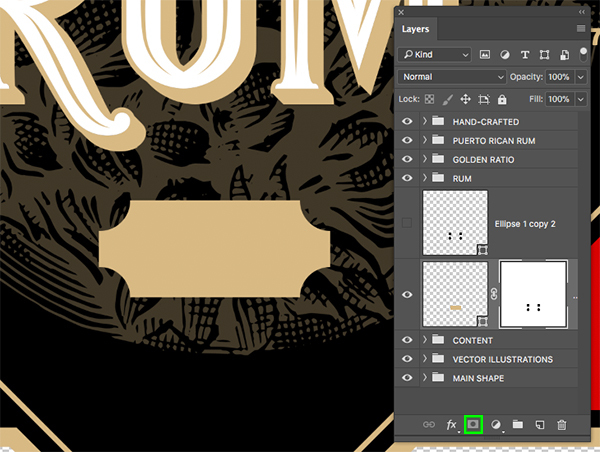 After opening the panel we can check to make sure that we are using the same gold fill color that we used earlier (#D8B983) and that our typeface is about ’147.5 pt’ with a ‘Tracking’ setting of about ’20’. 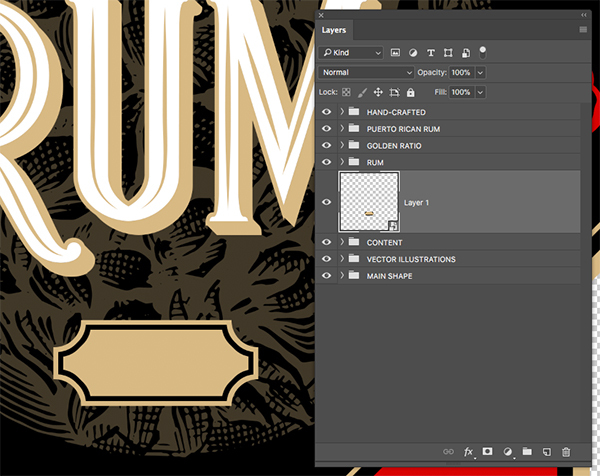 Next, select the text layer and press Command/Ctrl+J to duplicate it. 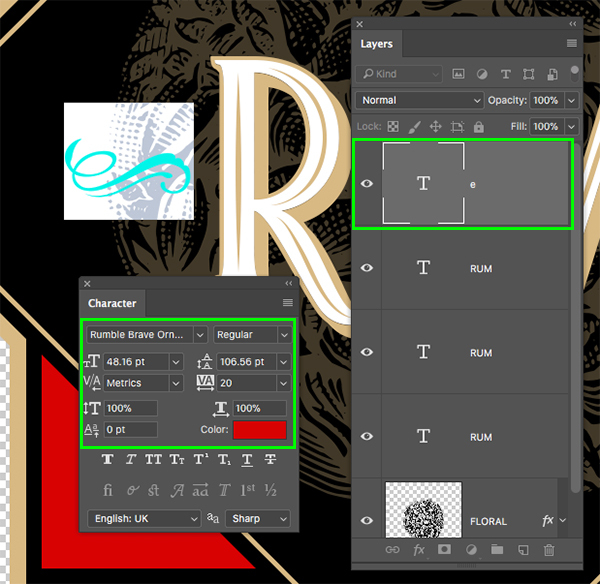 We can now grab our Type Tool (T) once again and change the style from ‘Shadow 3D’ to the ‘Regular’ version of the font. 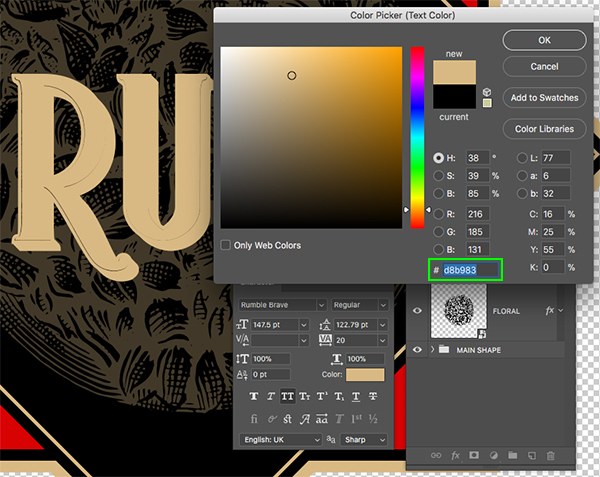 At the moment my text is filled with solid black so I’ll click on the ‘Color’ box and change it to the same gold color. 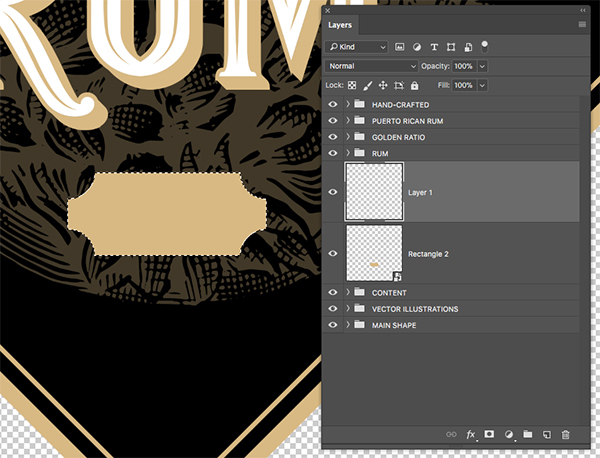 Next, duplicate this text layer a third time and change the style to ‘Outline’ with a solid white fill. We should now have three layers stacked on top of each other to create our effect. While this typeface works nicely for our design you can substitute this with any other type of vintage font that has a few styles to work with. Create another new layer and this time type out the letter ‘e’ using the ‘Ornaments’ style of ‘Rumble Brave’. For this part the font is not absolutely necessary as there are a variety of free typefaces that have ornaments that will do the trick. 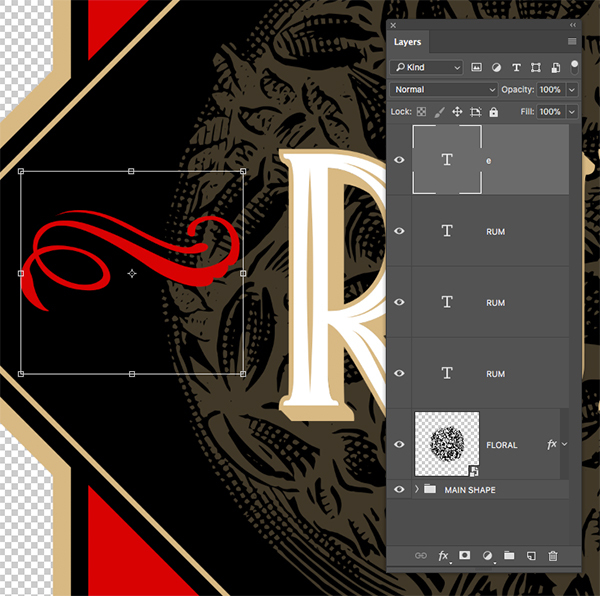 You can also use any vector pack of ornaments that you may already have from your design library. 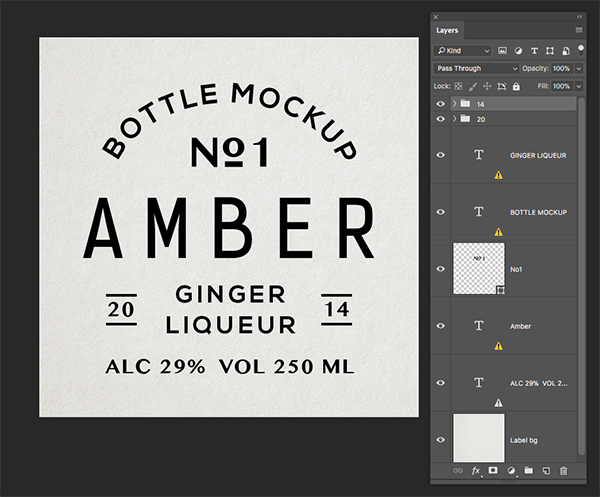 If you are using this typeface to follow along then let’s use the Character Panel to make a few adjustments. 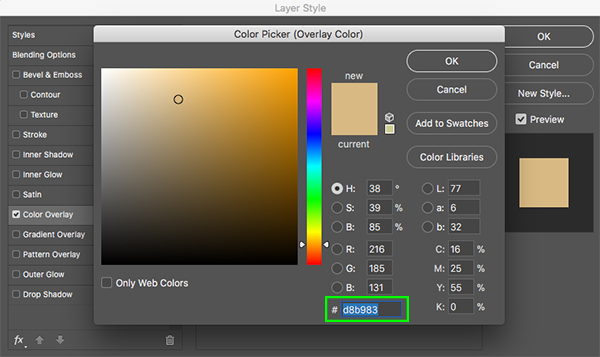 Select the ‘Color’ option in the panel and change the fill color to the hex value ‘#D90202’ and then press ‘OK’ to change the color to a more vibrant red. Press Command/Ctrl+T to do a Free Transform and once the bounding box appears around the ornament press the Control Key and click on the character to reveal a dropdown menu. 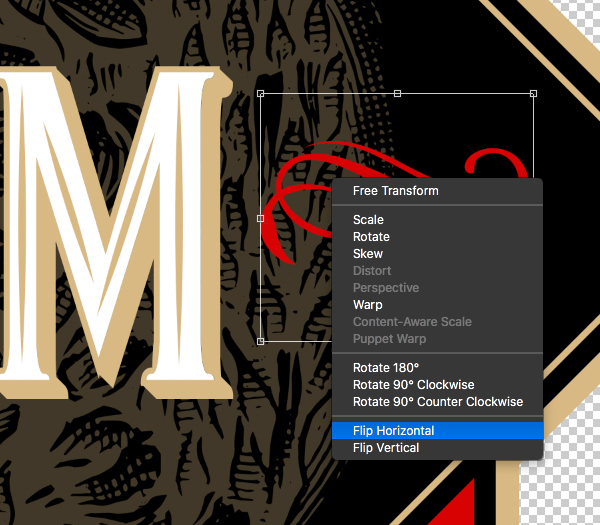 From here, let’s choose ‘Flip Vertical’ to flip the ornament and then press ‘Return’ to apply the changes. 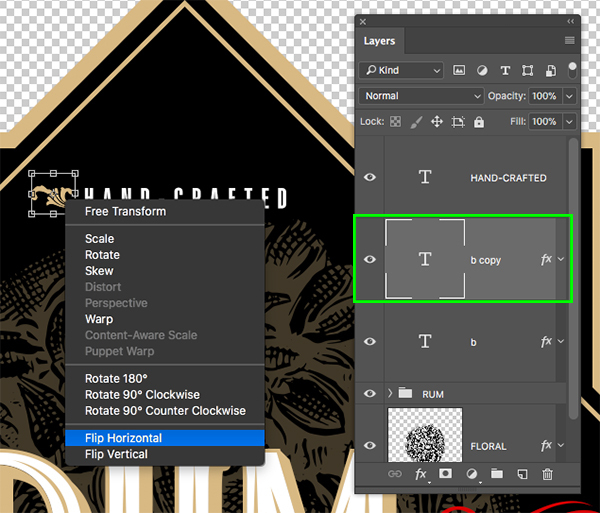 From here we can simply adjust the size by doing another Free Transform and scaling the ornament up a bit while holding the Shift Key to make it larger. 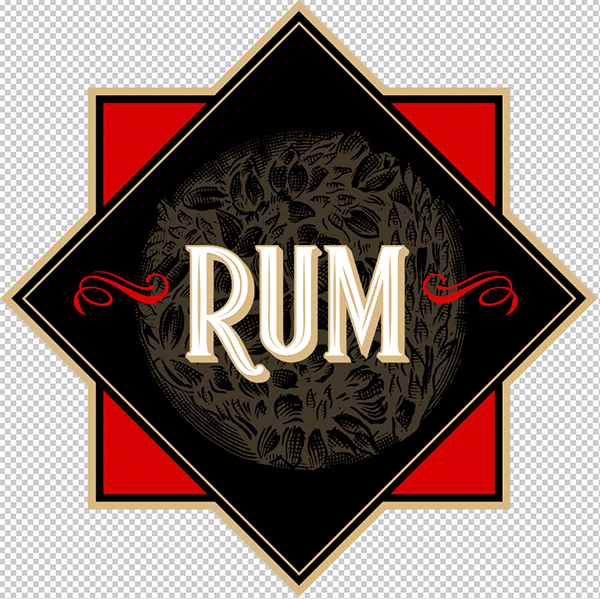 Once you are happy with the size of the first red ornament, press Command/Ctrl+J to duplicate the layer and move it to the opposite side of the word ‘Rum’. Press Command/Ctrl+T to initiate the Free Transform once again and click on the shape while holding the Control Key. 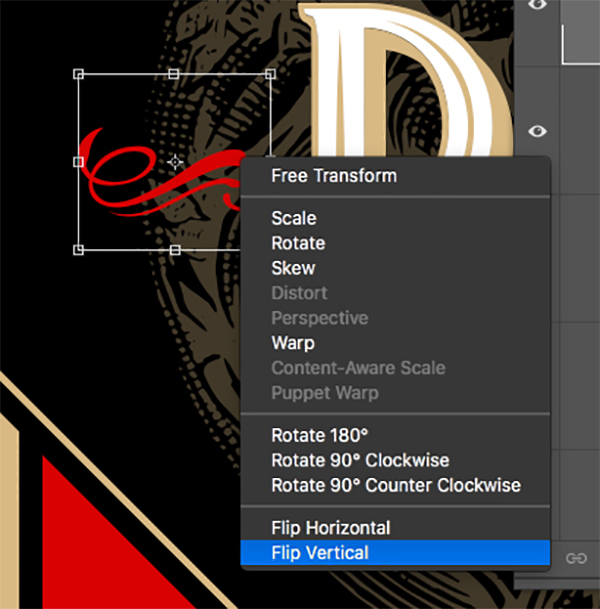 This time let’s choose ‘Flip Horizontal’ from the list so that it flips the opposite way. 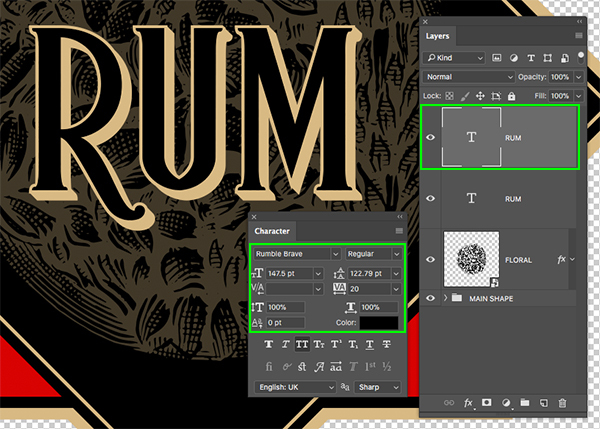 Select the top ornament shape in your Layers Palette, then hold the Shift Key and click on the bottom ‘Rum’ text layer. 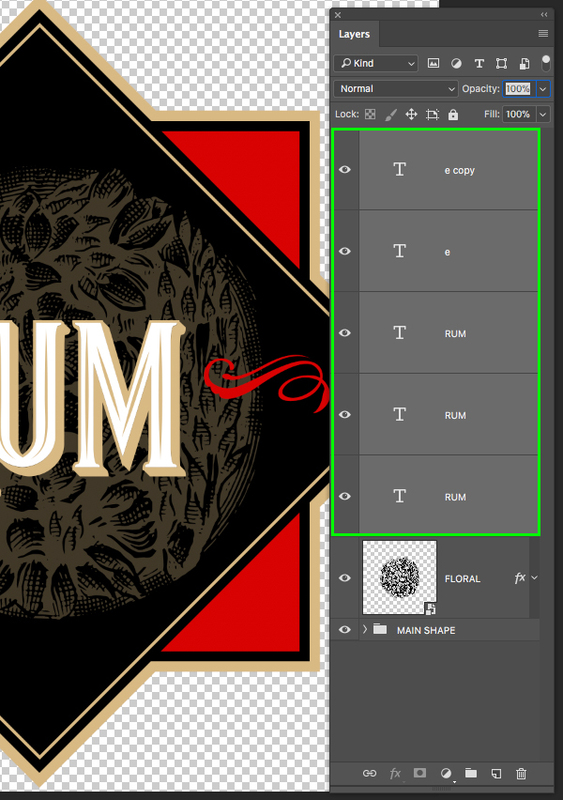 Create a new layer above the ‘RUM’ folder and use your Type Tool (T) to type out a lowercase ‘b’ using the same ‘Ornaments’ style of the ‘Rumble Brave’ font that we used earlier to create the red ornaments on both sides of the main text. You can also use any other ornaments here that you like. 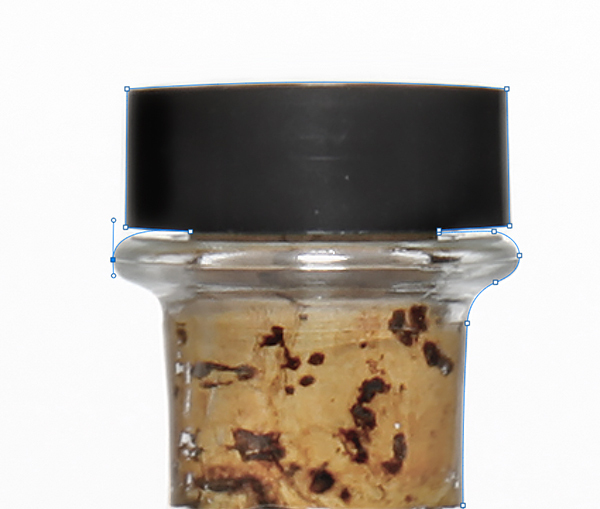 For the fill color we will once again use our gold which is ‘#D8B983’. After entering the hex value go ahead and click ‘OK’ or press the ‘Return’ key twice to apply the changes and close out of both dialog boxes. Select your gold ornament and press Command/Ctrl+J to duplicate it. After that, press Command/Ctrl+T and then hold the Control Key and click on the newly duplicated ornament layer to reveal a dropdown menu. 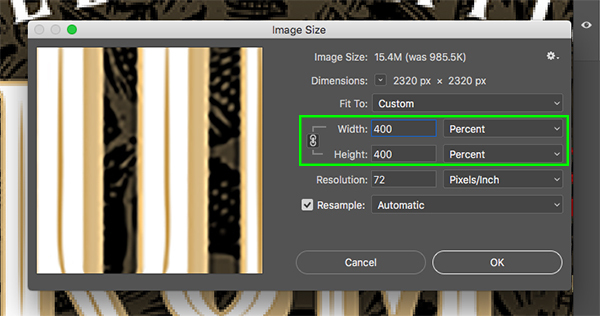 From here, choose the ‘Flip Horizontal’ option and then slide this copy over to the opposite side of the text. 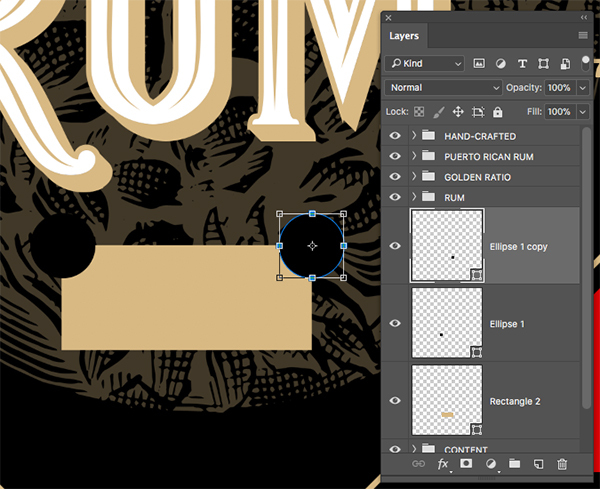 After placing both of your gold ornaments around the ‘HAND-CRAFTED’ text, let’s hold the Shift Key, select the top layer, and then click on the bottom ornament layer so all three of the layers are selected simultaneously. 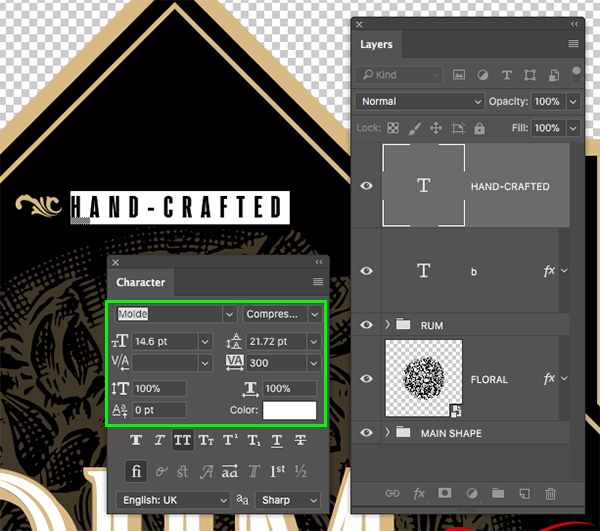 With these three layers selected, press Command/Ctrl+G to put them into a new folder and double click on the ‘Group 1’ text and change the name of the folder to ‘HAND-CRAFTED’. 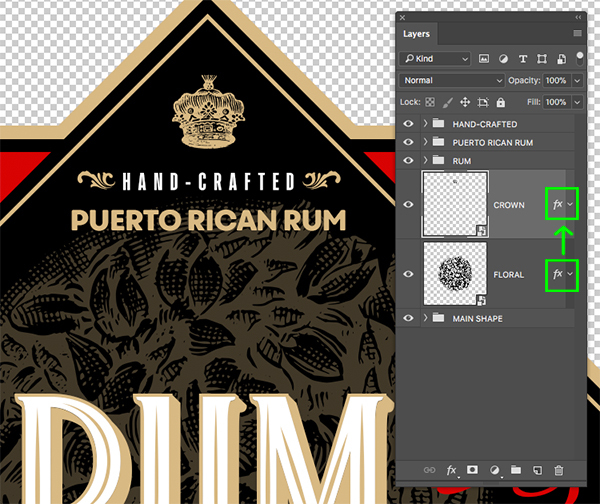 Create a new layer and use your Type Tool (T) to type out the words ‘PUERTO RICAN RUM’ in all uppercase. 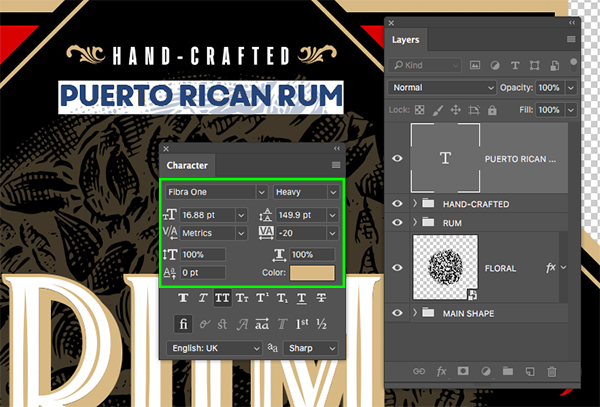 Check the Character Panel and use the ‘Fibra One’ typeface in the ‘Heavy’ style with a point size of ’16.88’. 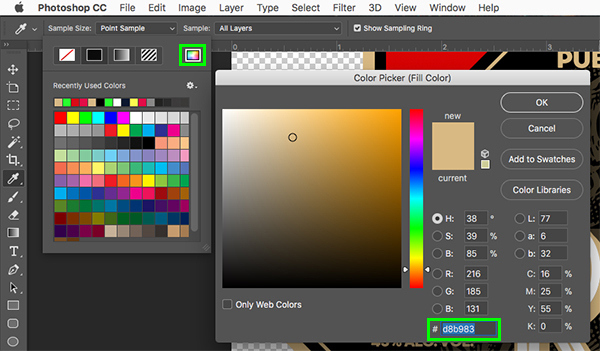 Let’s also click on the ‘Color’ box and use our gold fill color. Another font that could work nicely here would be a clean and bold sans serif such as ‘Avenir’ or ‘Gotham’ in one of the heavier weights. 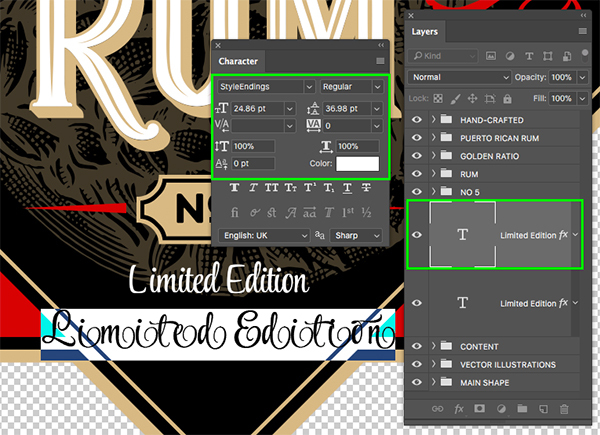 After placing your text beneath the ‘HAND-CRAFTED’ text, select your layer and press Command/Ctrl+G to put the new text into a folder of it’s own. 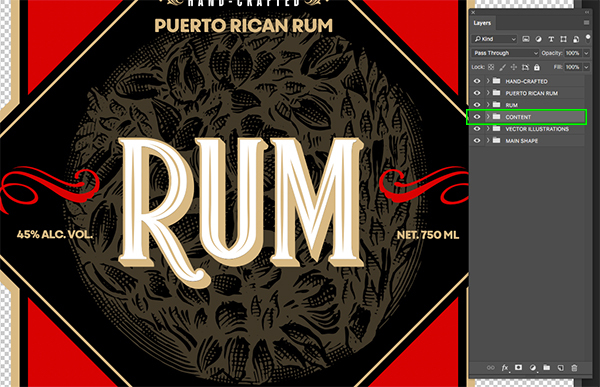 Next, double click on the folder name and change it to ‘PUERTO RICAN RUM’ before continuing. 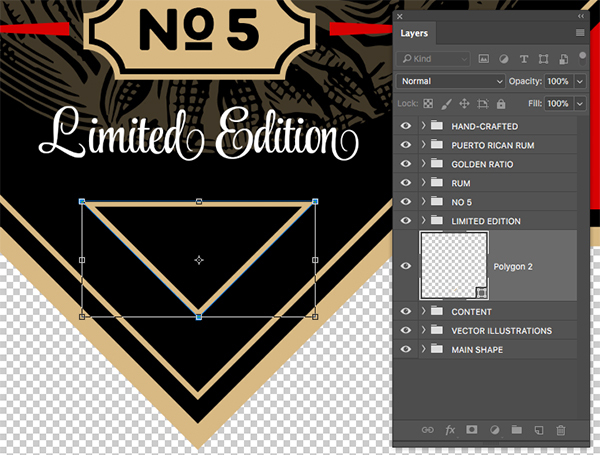 Here I will be using a vintage crown illustration from ‘The Ultimate Vector Bundle’. If you have purchased this bundle, you can navigate to the Vector Hut folder, choose the file called ‘Crown-6.png’ and select ‘Place’ from the bottom right corner. 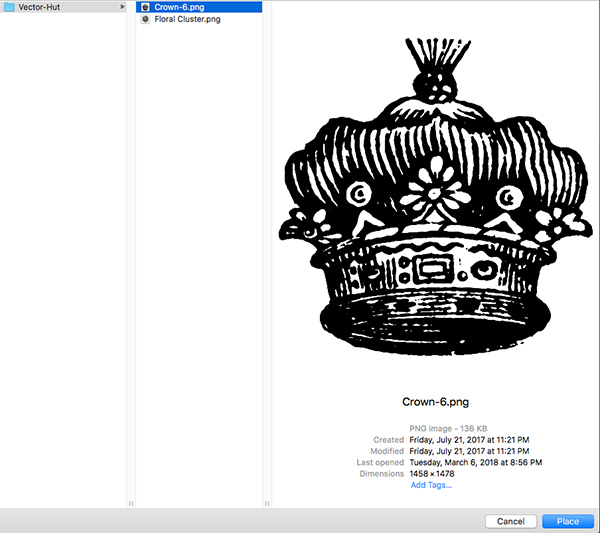 If you don’t have access to this specific illustration, any crown shape or illustration should suffice. 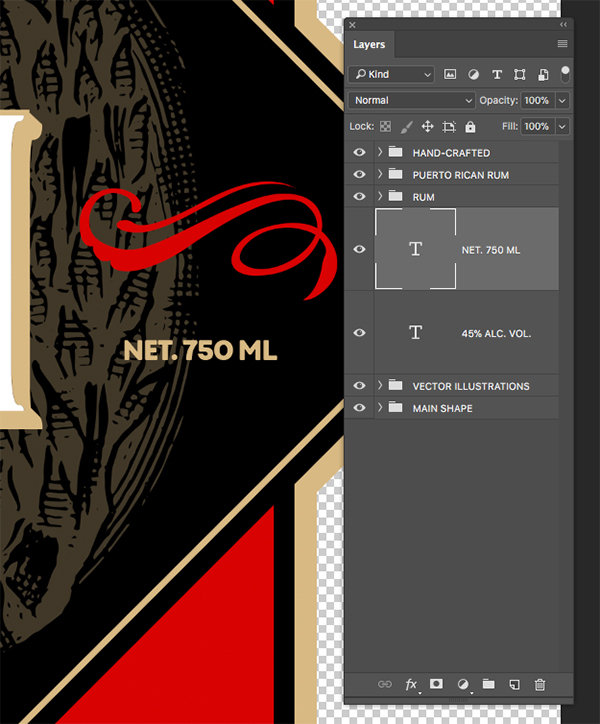 You should now see your illustration with a bounding box around it and it will most likely be quite a bit larger than what we will actually need. 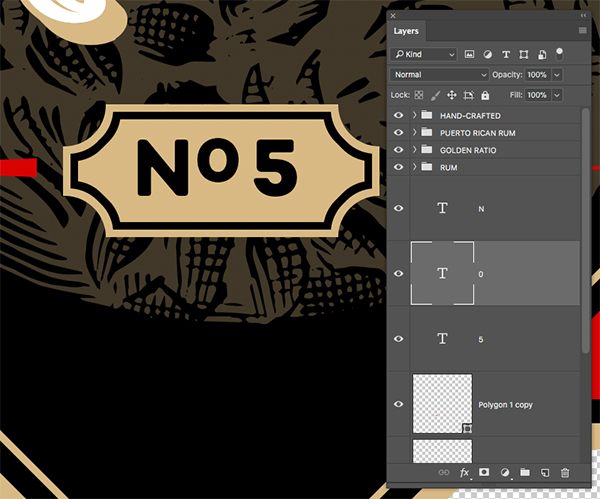 Let’s hold the Alt/Option+Shift keys and drag inwards from any of the four corners of the bounding box to reduce the scale of the crown and place it above the ‘HAND-CRAFTED’ text before pressing ‘Return’ on the keyboard to place the vintage illustration. 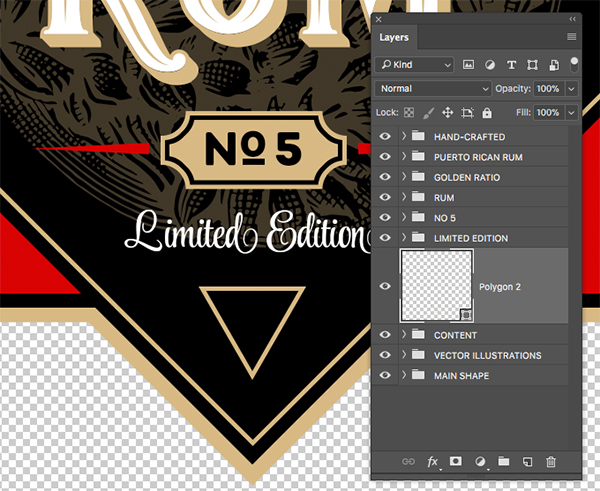 Let’s now double click on the ‘Crown-6’ text in the Layers Palette and change the name of the layer to ‘CROWN’. 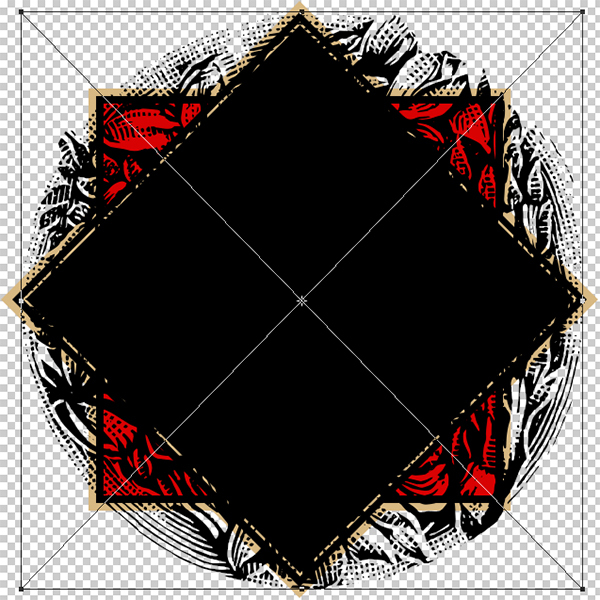 Place the ‘CROWN’ layer just above the ‘FLORAL’ layer and then hold the Alt/Option Key and click and drag the small ‘fx’ icon from the ‘FLORAL’ layer onto the ‘CROWN’ layer. Doing this should apply the same style to the crown. 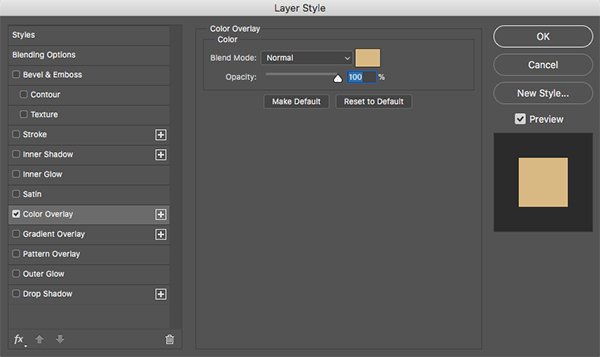 Hold the Command/Ctrl Key and select both of these layers before pressing Command/Ctrl+G to put them into a new folder. Let’s rename the folder ‘CONTENT’ or use a similar name that will make it easy for you to identify the layers you need if you have to make any changes. 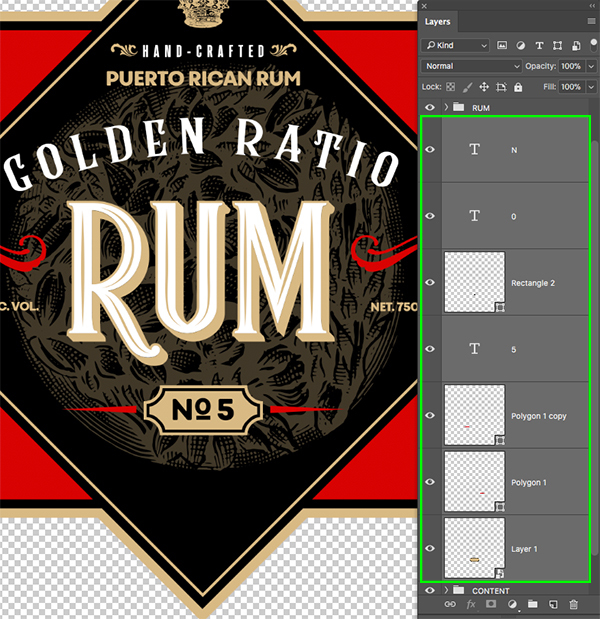 Create a new layer below the ‘PUERTO RICAN RUM’ folder and type out the words ‘golden ratio’ in all lowercase letters. Let’s refer to our Character Panel to change the typeface to the ‘Regular’ style of ‘Rumble Brave’. 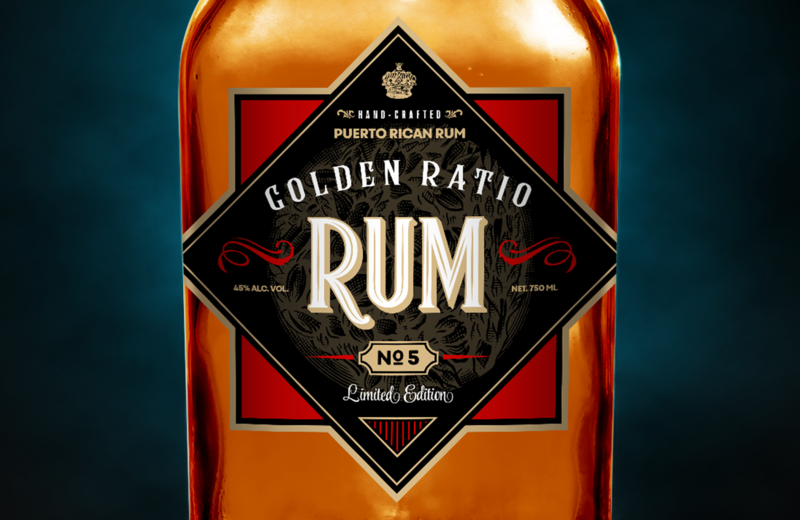 If you used another typeface for the main ‘RUM’ text then use that font here so that it will be consistent. Let’s check to make sure that our text is about ’47.5 pt’ with a ‘Tracking’ setting of about ’180’ and give it a solid white fill. 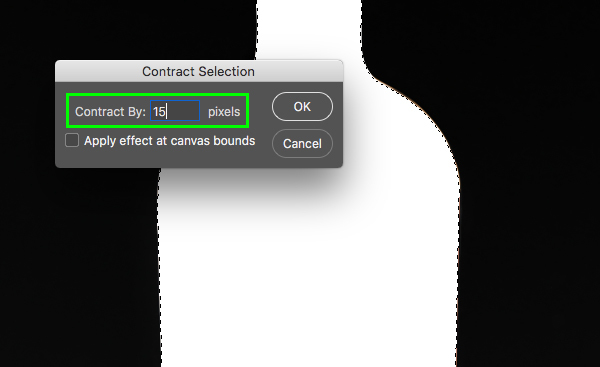 Grab your Type Tool (T) and click inside of the text box two or three times to highlight all of the text. 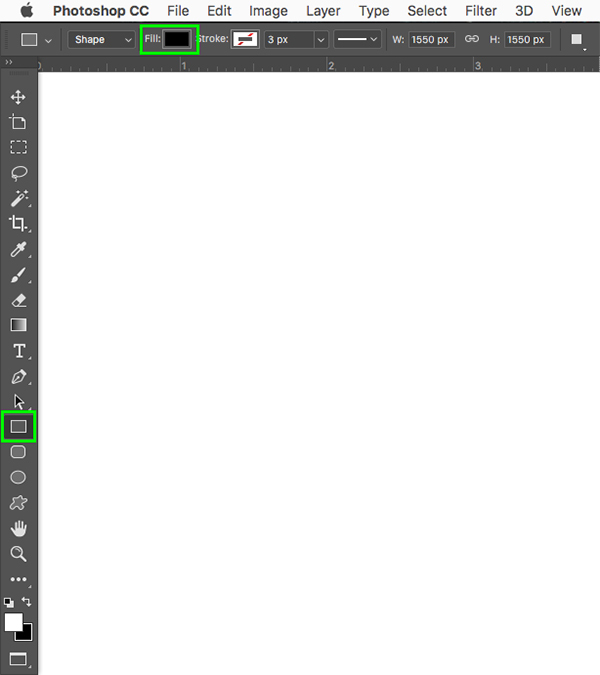 From here, click on the small ’T’ icon with a curved line underneath it in the top toolbar. 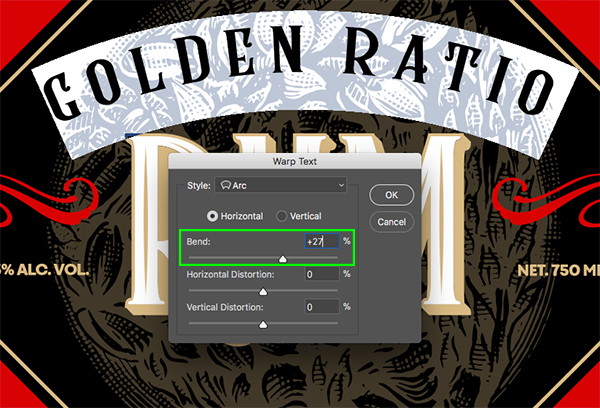 If you hover your cursor over this icon it will say ‘Create warped text’. After clicking on the small icon you will be prompted with the ‘Warp Text’ dialog box. 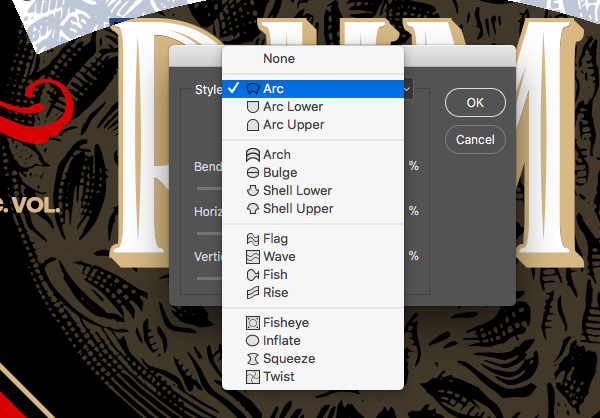 Click the menu next to the word ‘Style’ and then choose the ‘Arc’ option from the list. Let’s make sure to select the ‘Horizontal’ option if it isn’t already selected, and then enter a ‘Bend’ value of about ‘+27’ before clicking ‘OK’ to apply the changes. 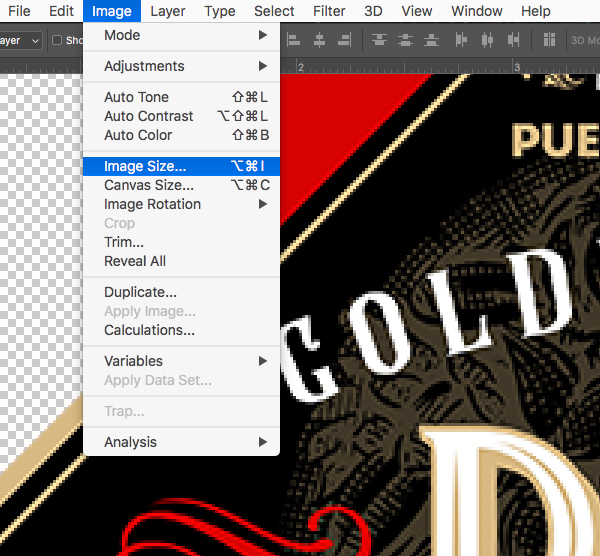 Press ‘U’ on the keyboard to get the Rectangle Tool and then choose the ‘Fill’ option and change it to ‘#D8B983’ so it matches the gold we have been using throughout. 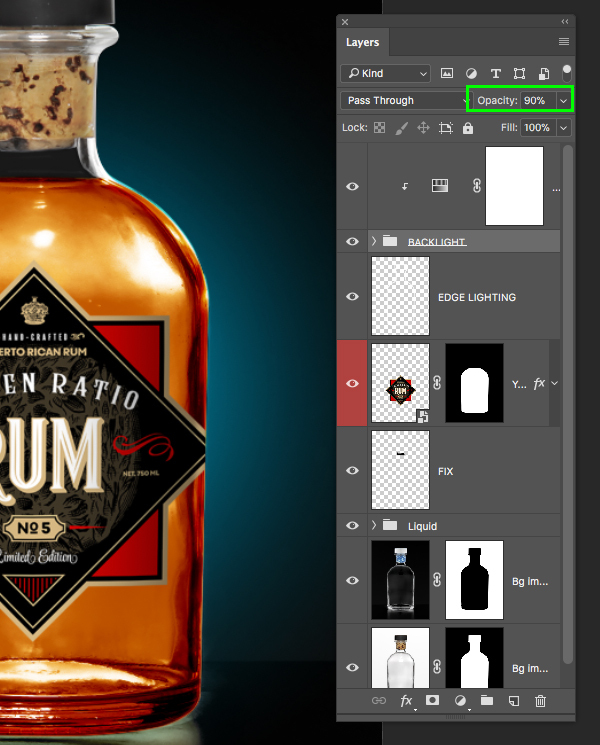 Click and drag out a rectangle below the main ‘Rum’ type. Press the Shift Key and then ‘U’ on the keyboard until you have the Ellipse Tool. 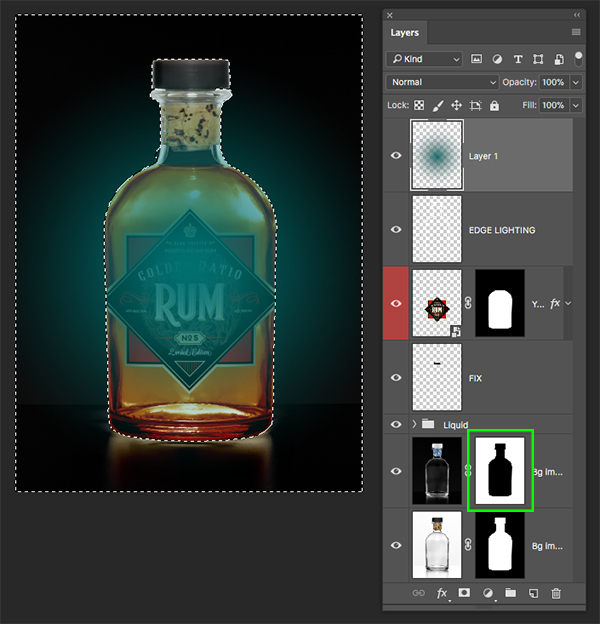 Next, make sure that the fill color is now set to black. Hold the Shift Key and click and drag out a circle over the upper left corner of the gold rectangle shape. Select the circle and press Command/Ctrl+J to duplicate it. Hold the Shift Key and move the duplicate copy over the top right corner of the rectangle. Next, select the first circle shape, hold the Shift Key, and then select the second copy. 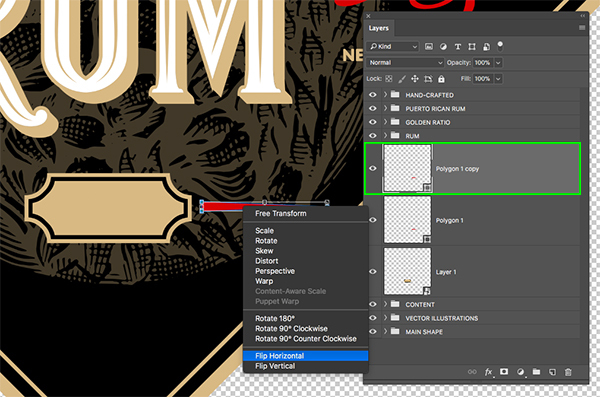 With both circles selected at the same time, press Command/Ctrl+E to merge the two layers together. 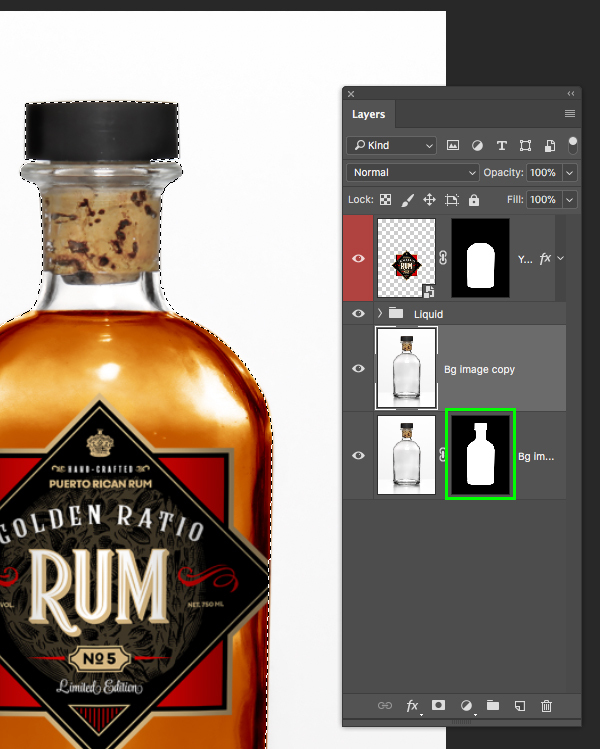 Select the merged circle layer and press Command/Ctrl+J to duplicate the merged circles. Next, hold the Shift Key and drag this copy down so that you end up having all four corners of the gold rectangle covered by the black circles. Once you have placed all of the circles, hold the Command/Ctrl Key and select both layers containing all four of the circles and then merge them together again by pressing Command/Ctrl+E on the keyboard. 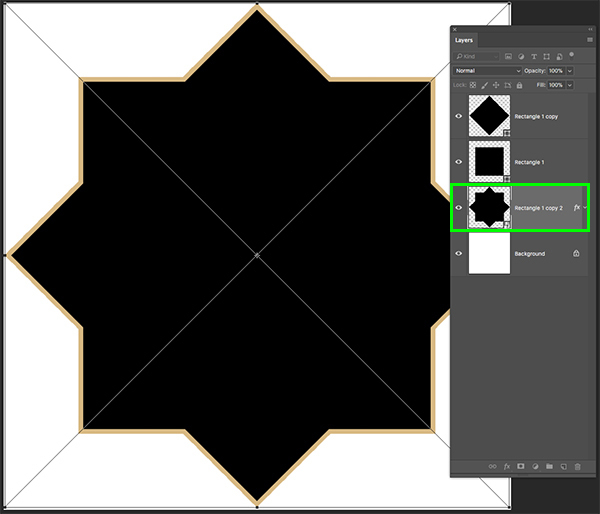 Next, hold the Command/Ctrl Key and click on the layer thumbnail icon of the merged black circle layer to activate a selection around all four of the circles. Once you have done that, select the gold rectangle shape below. 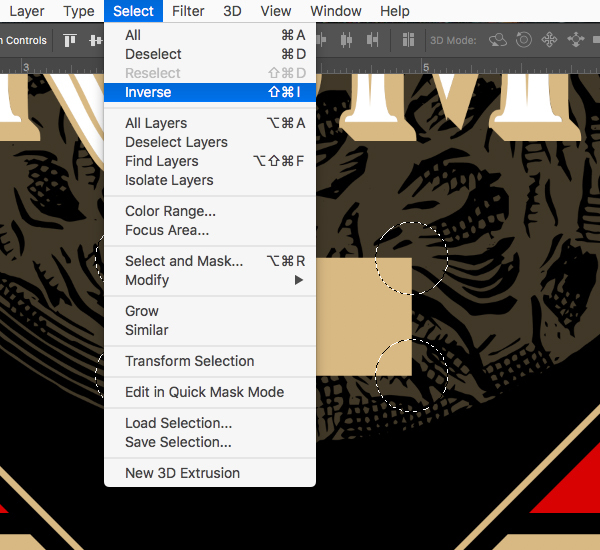 Make sure that you still have the gold rectangle layer selected and then click on the ‘Add Layer Mask’ icon at the bottom of the Layers Palette to apply a mask. 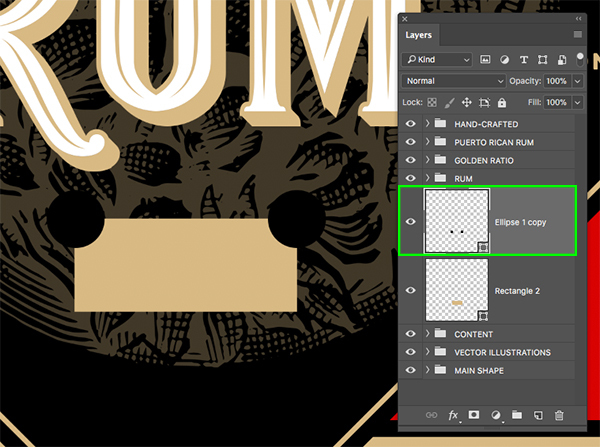 You can now delete the merged circle layer above the gold rectangle layer. 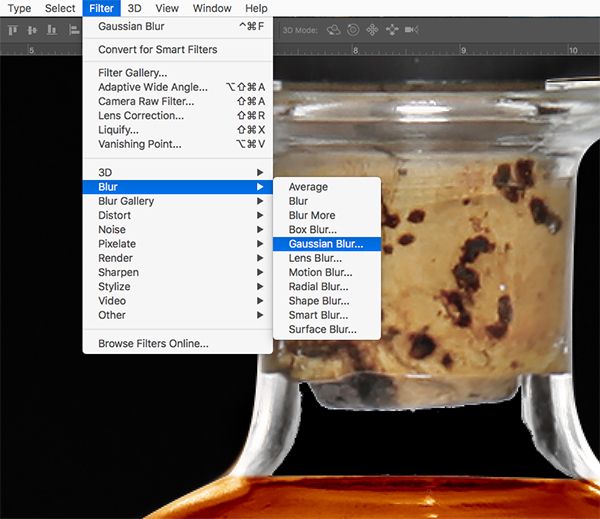 Hold the Control Key and click on the gold rectangle layer and then choose ‘Convert to Smart Object’ from the menu that appears. 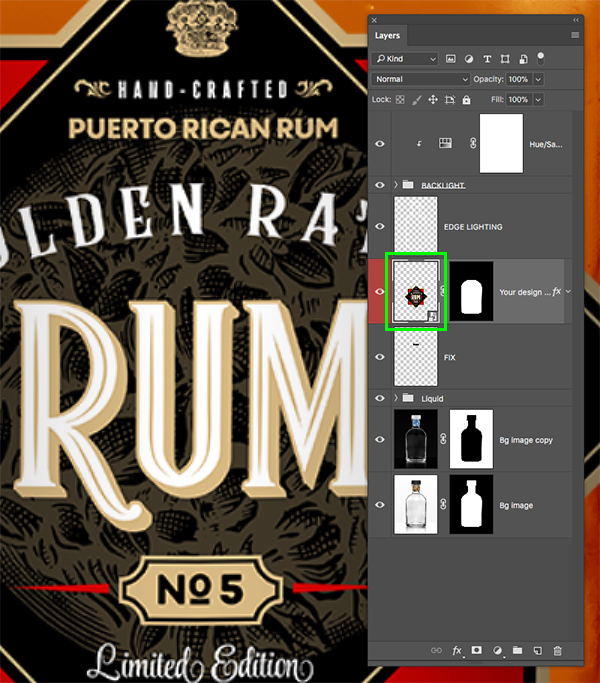 Hold the Command/Ctrl Key and click on the layer thumbnail icon of the gold rectangle Smart Object layer to activate a selection around it. 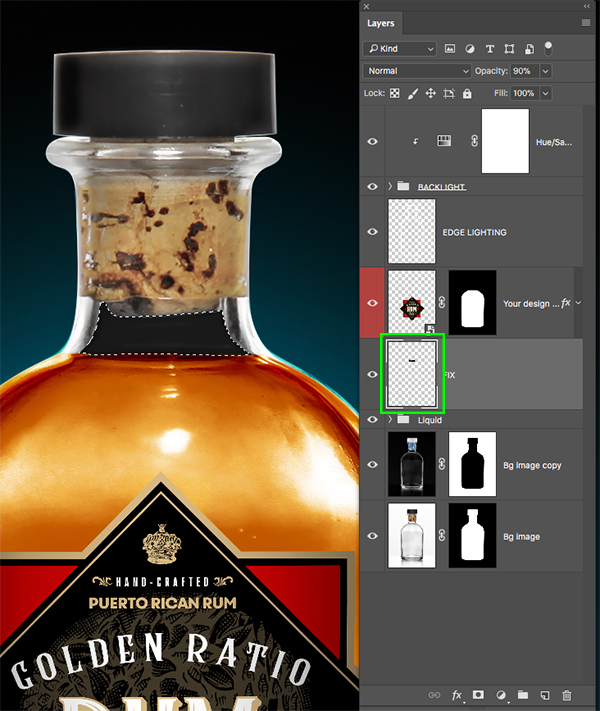 While the selection is active, add a new layer. Enter a value of ’10’ and then press ‘OK’ or ‘Return’ on the keyboard. 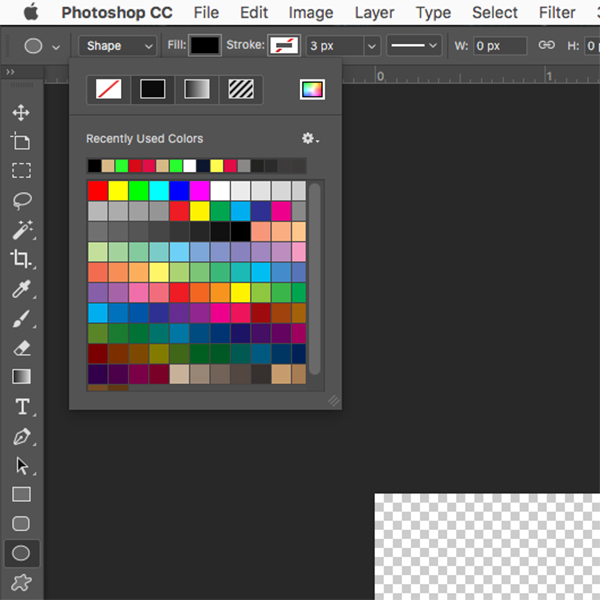 Now select your new layer and then press ‘D’ on the keyboard to get your default colors and make sure that you have solid black as your foreground color. 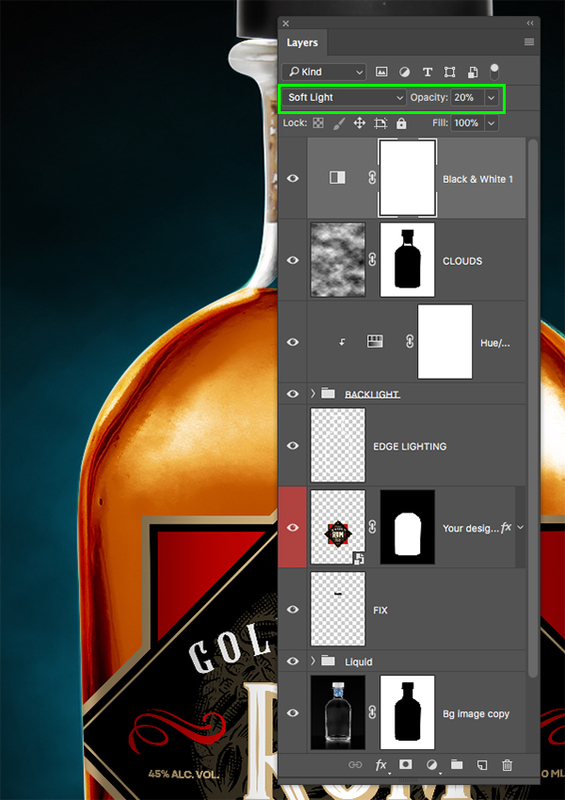 After that, press Alt/Option+Delete on the keyboard to fill the selection with black. 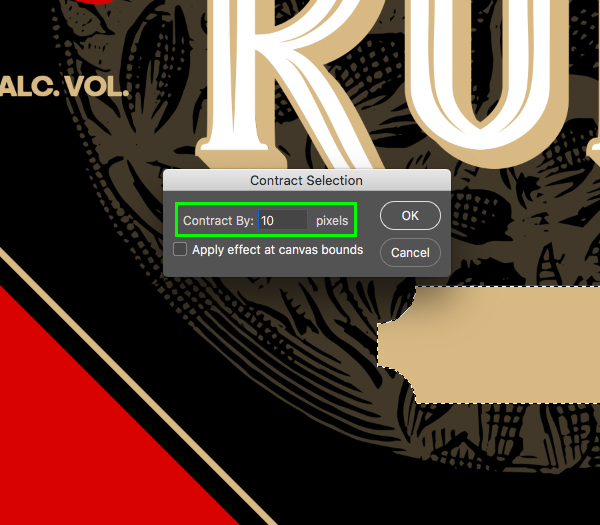 While your selection is still active, return to the Select menu and once again choose ‘Modify > Contract…’ before entering a value of ’10’ to contract the selection by another 10 pixels. 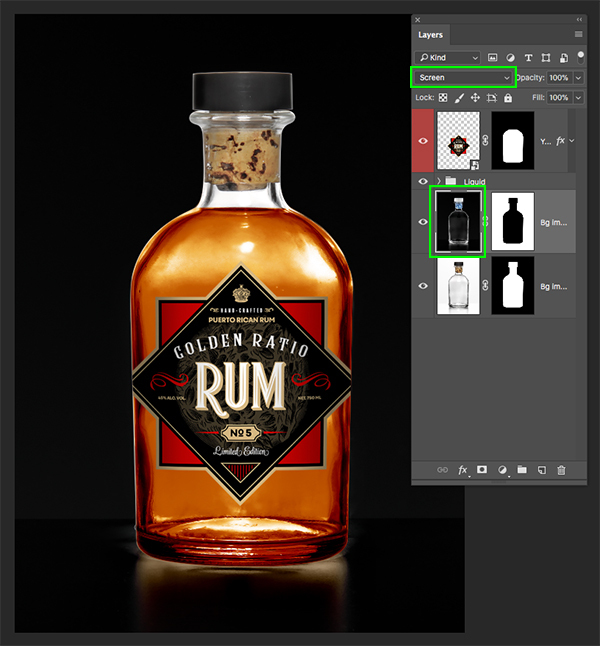 You should now have your gold rectangular box with the circles knocked out along with the inner black stroke all merged into a single Smart Object layer. Press ‘U’ on the keyboard again while holding the Shift Key until you have the Polygon Tool selected. 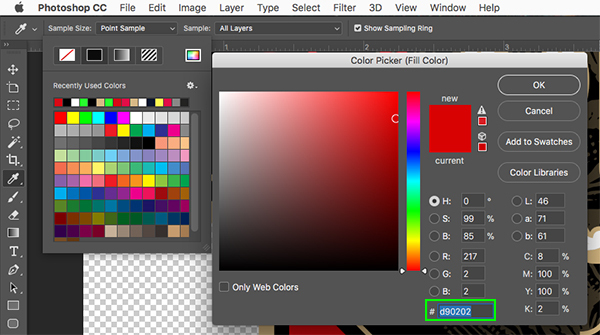 From here, check the toolbar in the top and make sure that you have ‘3’ for the ‘sides’ and a red fill color. For the fill, let’s use the hex value ‘#D90202’ that we used earlier. Hold the Shift Key and drag out a triangle next to your seal. 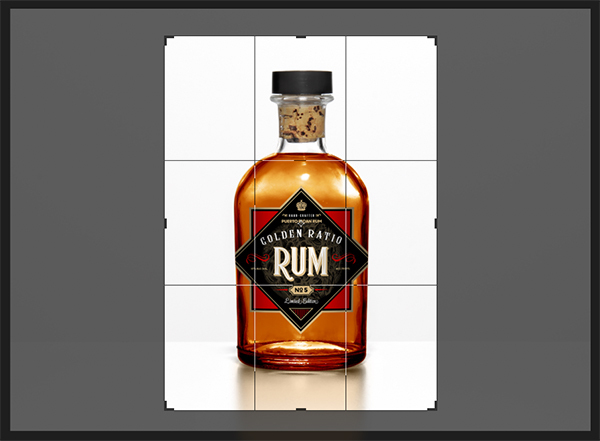 Press Command/Ctrl+J to duplicate the shape and then hold the Control Key and click on it to reveal a dropdown menu. From this list, let’s choose ‘Flip Horizontal’ and then move this copy to the opposite side of the seal. 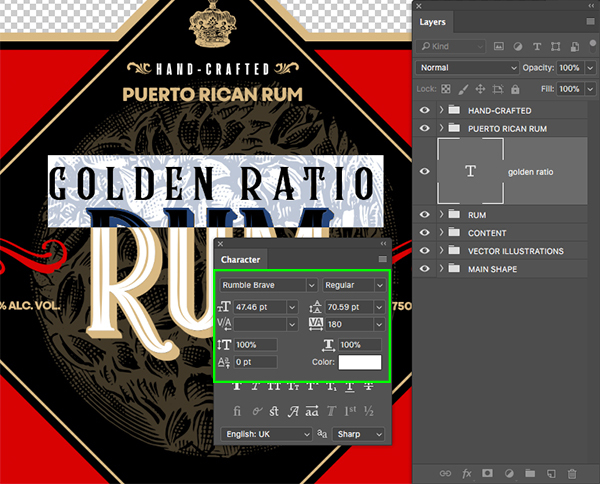 Create a new layer and use your Type Tool (T) to type the letter ’N’ using the same typeface we used for our ‘PUERTO RICAN RUM’ text from earlier. 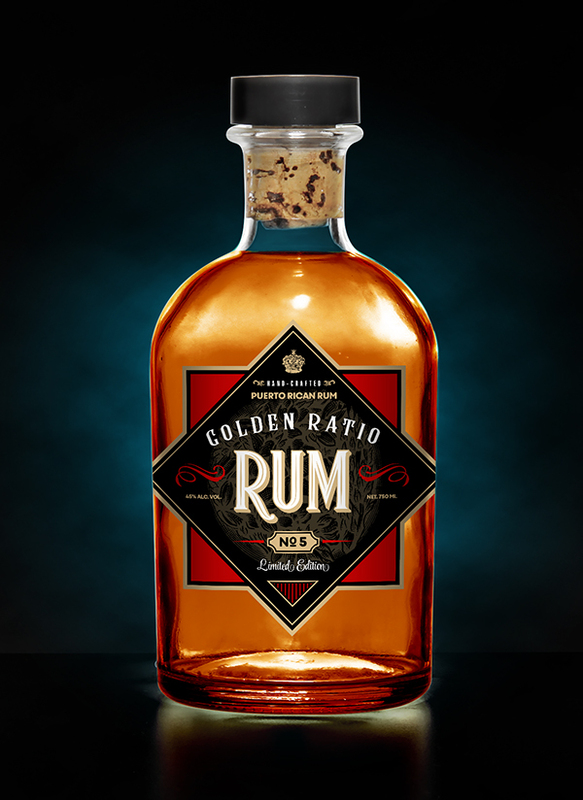 Let’s change the text color to black and make it just large enough to fit comfortably inside of the seal. 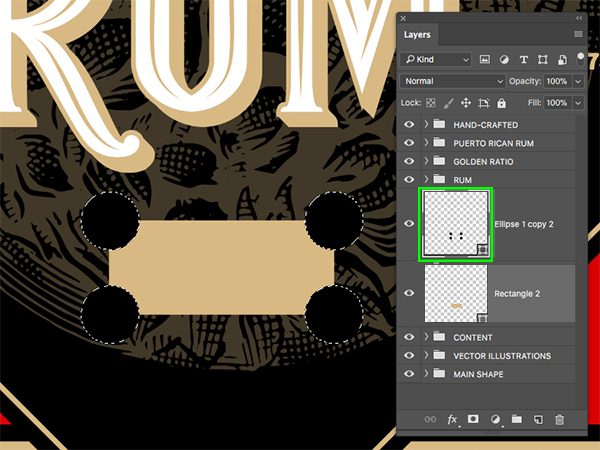 Duplicate the layer again and change the text to the letter ‘O’ and then scale it down using a Free Transform (Command/Ctrl+T). 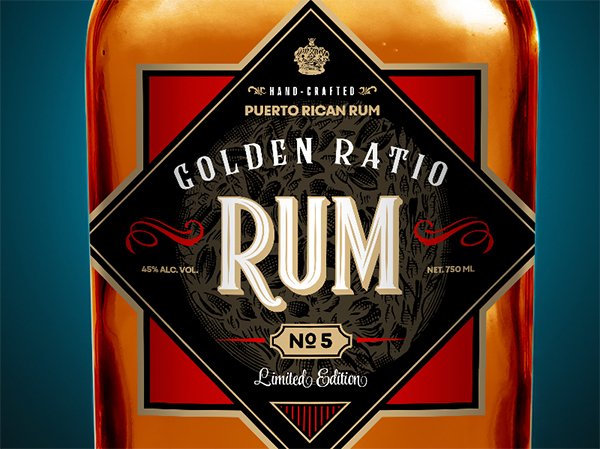 Here we just want to make sure that the top of the ‘O’ is aligned with the top of the letter ’N’ and the number ‘5’. Press ‘U’ to get your Rectangle Tool and then add a black rectangle beneath the letter ‘O’ that is about the same width as the strokes of the other letters and numbers. 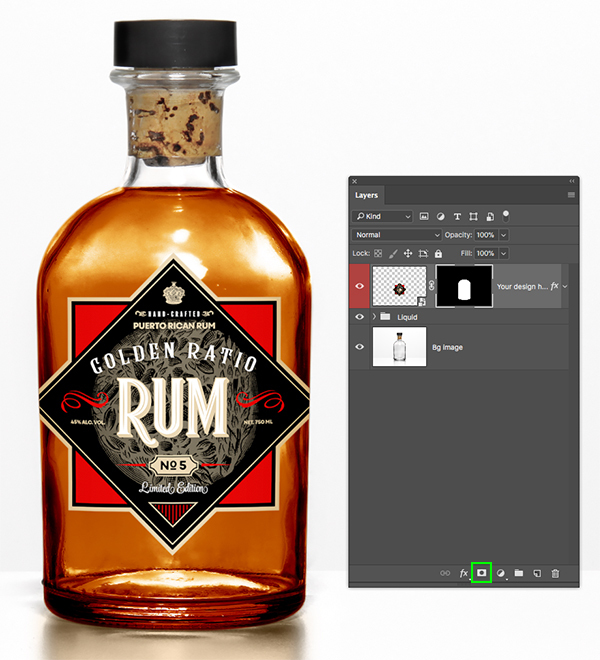 Next, select the ’N’ text layer, then hold the Shift Key and select the gold seal Smart Object layer so all of the layers with this shape are selected at the same time. 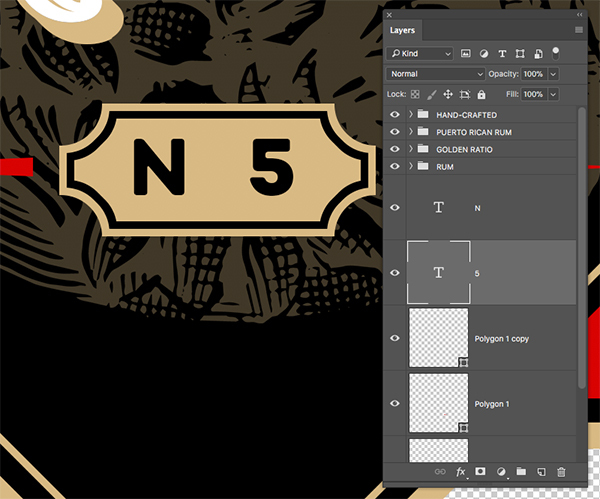 Create a new layer below the ‘NO 5’ folder and switch to your Type Tool (T). 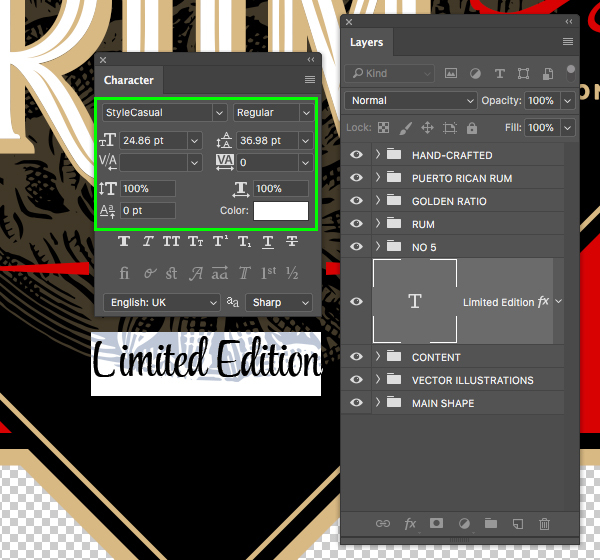 Type out the words ‘Limited Edition’ and open up the Character Panel. For the typeface I am using ‘StyleCasual’ from the bundle, but any nice script font will work just to add a bit of variety to our fonts. Let’s also make sure that the size is about ’24 pt’ and that we have a solid white fill color. 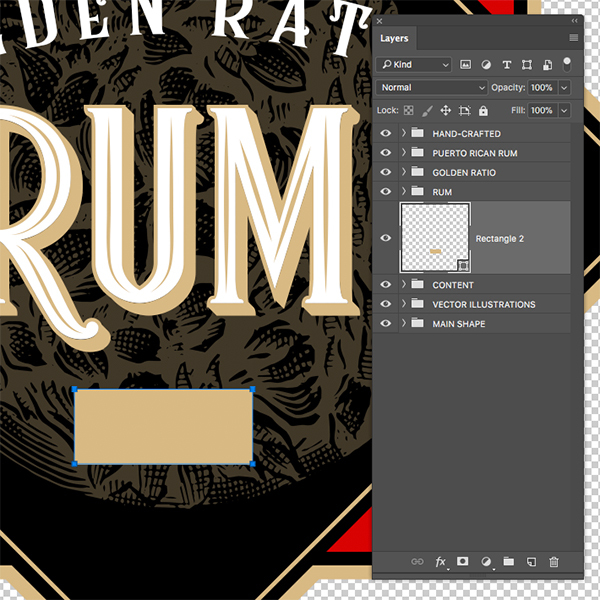 Press Command/Ctrl+J to duplicate the text layer and move it down below the previous layer. 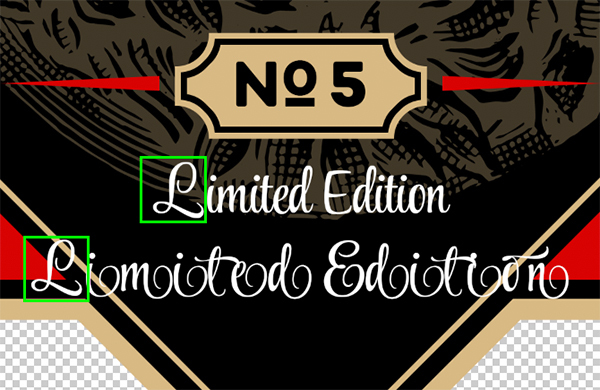 Use the Type Tool (T) to click inside the text box two or three times to highlight all of the text, and then change the typeface to ‘StyleEndings’ which is a slightly more decorative version of the font. We can now select any of the letters from the more ornate line of text and copy it, then return to the original line of text, highlight the character we’d like to replace, and paste it by pressing Command/Ctrl+V. In the image below you can see that I have done this to replace the letter ‘L’. 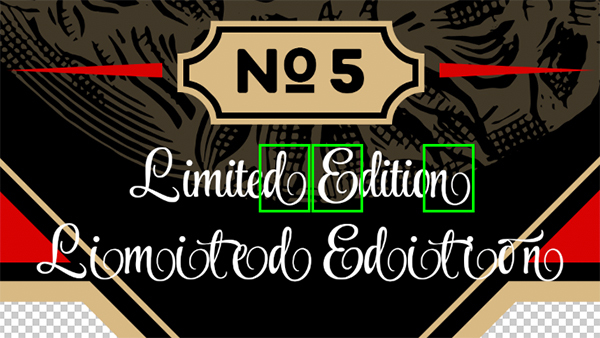 Repeat this process to replace the letter ‘d’ at the end of ‘Limited’ along with the ‘E’ in ‘Edition’ as well as the ’n’ at the very end. 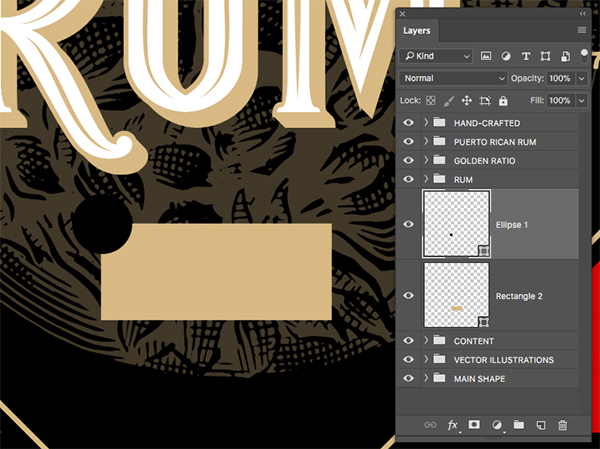 Once you have used all of the characters you want from the decorative version of the text you can delete that layer so you are left with your modified type layer. 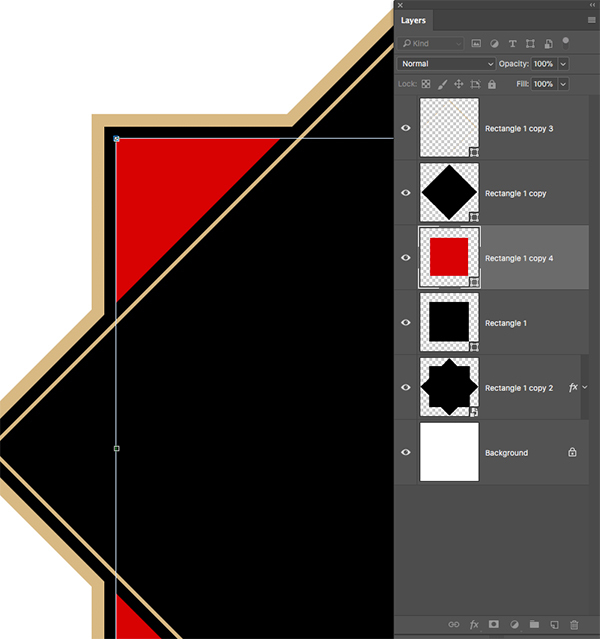 Press Command/Ctrl+T again and click and drag either of the side handles outwards while holding the Alt/Option Key to make the shape wider until the angle matches that of our main diamond shape. We should have our duplicate copy selected in the Layers Palette, and what we want to do is now change the settings so that there is no stroke and instead make it a solid gold fill. You should now have two copies of the triangle shape placed on top of one another – the bottom shape will just be the stroked version, and the top copy has the solid gold fill with no stroke. 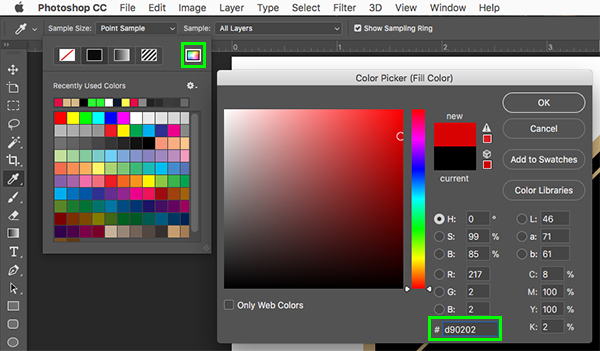 Press ‘U’ on the keyboard again to select the Rectangle Tool and change the settings so you have a solid red fill color – ‘#D90202’. 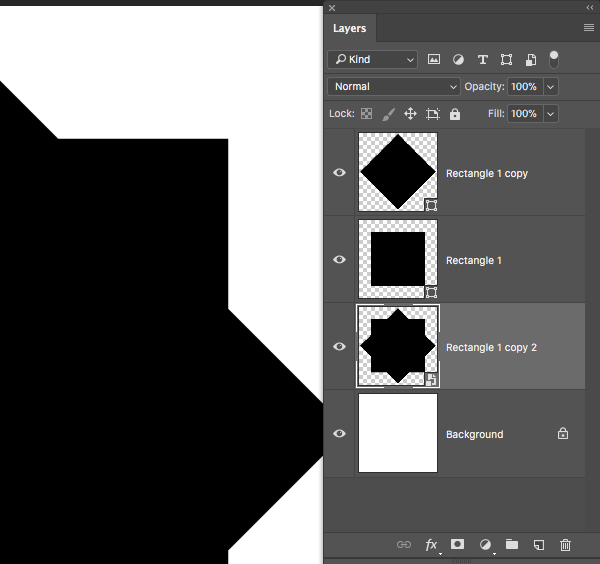 Click and drag a tall, thin rectangle that overlaps the left side of the triangle shape. Here I have turned off the visibility of the solid triangle as we don’t need it just yet. Press Command/Ctrl+J to duplicate your vertical red line and then hold the Shift Key and tap the right arrow three or four times to move it over to the right. Repeat this until you have about 10 copies going all the way across the triangle. After that, select the top line, hold the Shift Key, and select the bottom vertical line so all of the copies are selected at the same time. 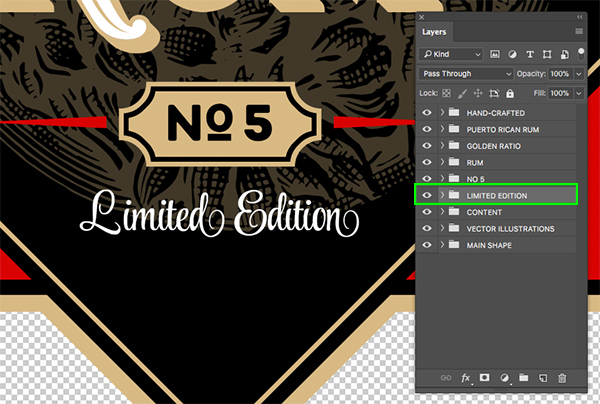 Next, hold the Command/Ctrl Key and click on the layer thumbnail icon of the solid gold triangle layer which is currently turned off. Doing this should activate a selection around the shape. 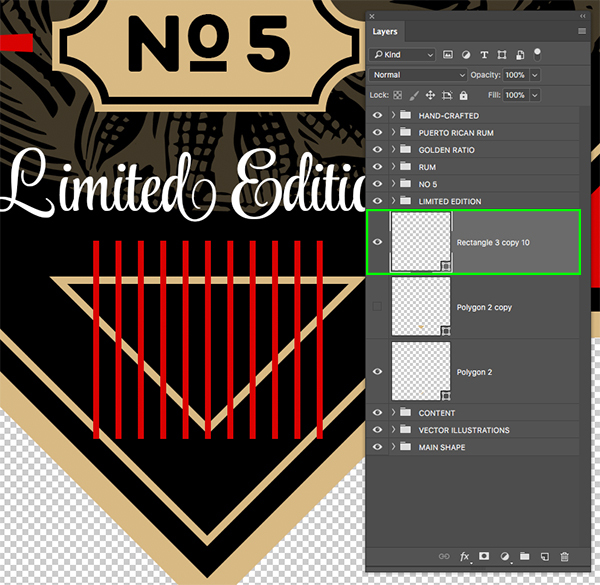 With the selection still active, click on your merged red line layer and then click on the ‘Add Layer Mask’ icon at the bottom of the Layers Palette to add a mask around the vertical lines. 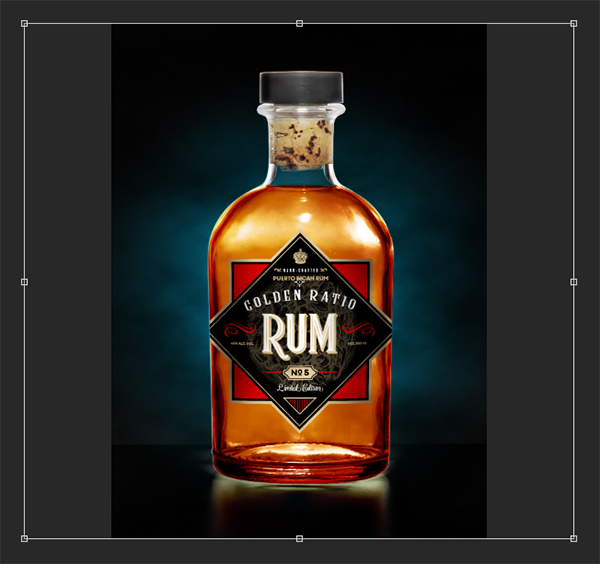 At this point we have completed the design of the actual rum label that we are going to be applying to our realistic bottle mockup! Let’s keep pushing this to take it further. 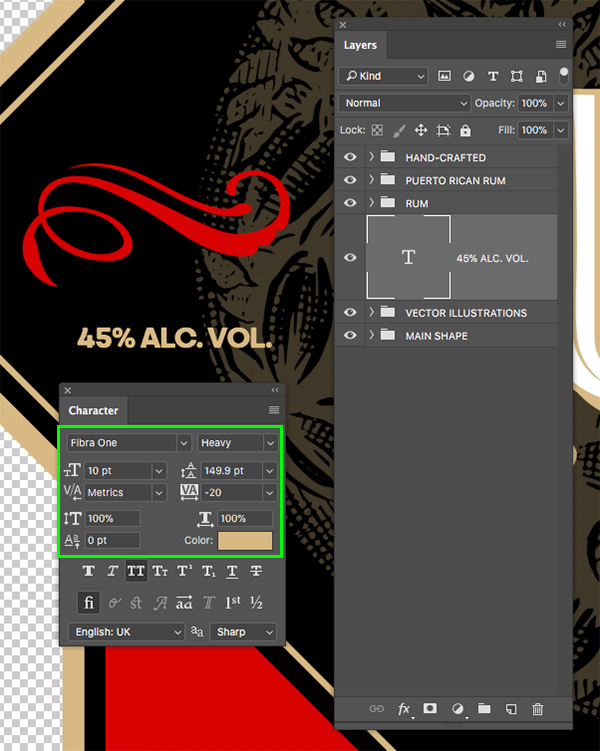 Select all of the folders in your Layers Palette by selecting the very top folder, holding the Shift Key, and then selecting the bottom folder. After that, press Command/Ctrl+J to duplicate all of the layers. 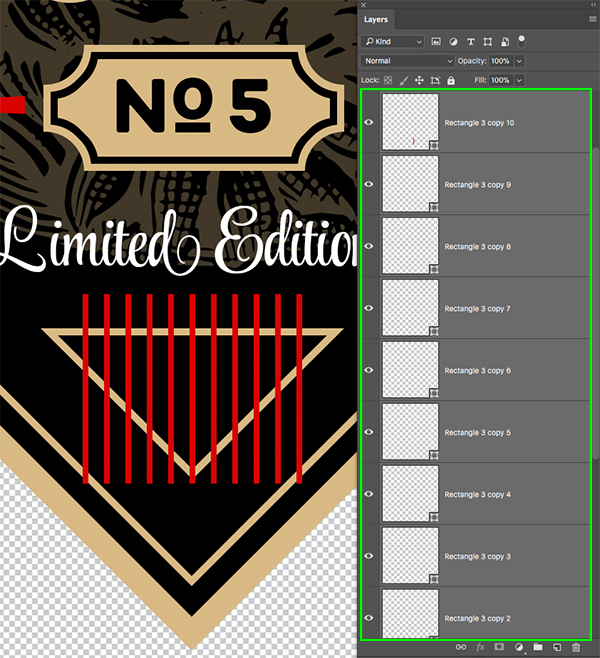 After that, press Command/Ctrl+E to merge all of the duplicate folders and layers together into one single layer. 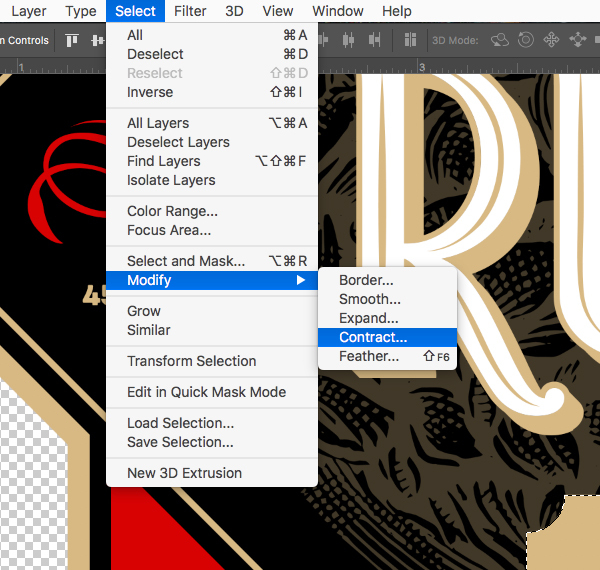 Let’s drag in our merged artwork and make fit into the workspace by using a Free Transform and dragging inwards from any of the four corners of the bounding box while holding the Alt/Option+Shift keys. 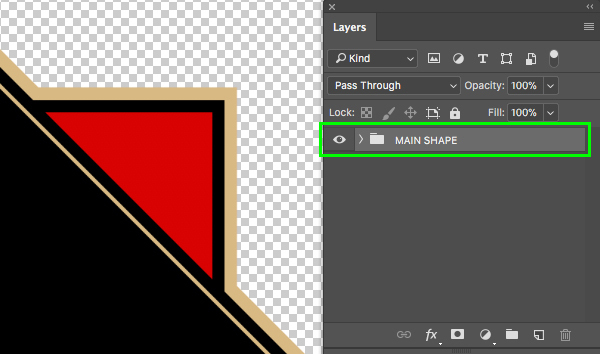 Let’s also go and hold the Control Key then click on the artwork to make it a Smart Object so that we can resize it as needed. 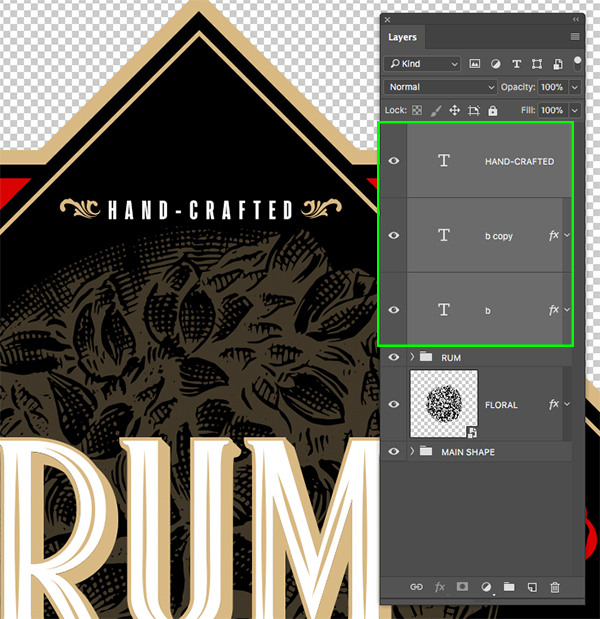 Once you’ve placed the label art into the file you can delete all of the other layers and then press Command/Ctrl+S to save it. 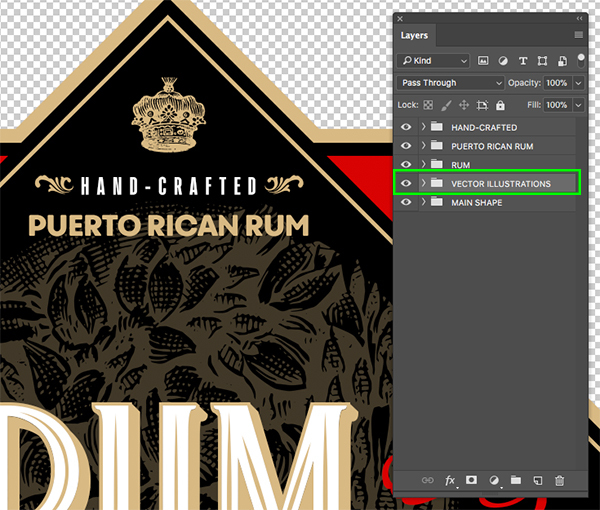 We can now close this tab and return to our main mockup PSD file where you should now see the updated label artwork, but there is a problem – the artwork is too small! 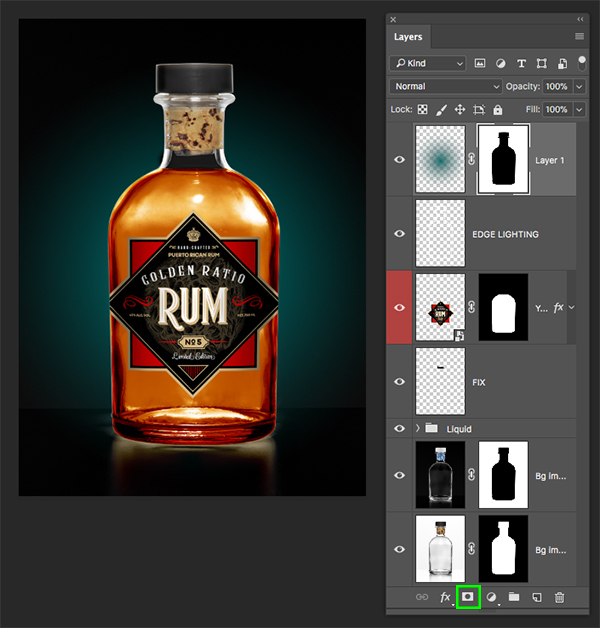 Let’s open the folder named ‘Liquid’ and then hold the Command/Ctrl Key and click on the layer thumbnail icon inside to activate a selection around it. 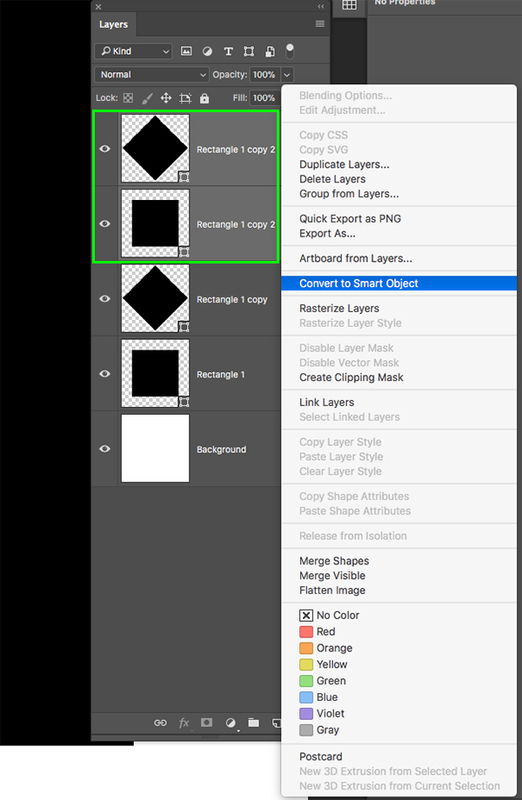 Now select the Smart Object layer with the artwork and then click on the ‘Add Layer Mask’ icon from the bottom of the Layers Palette. 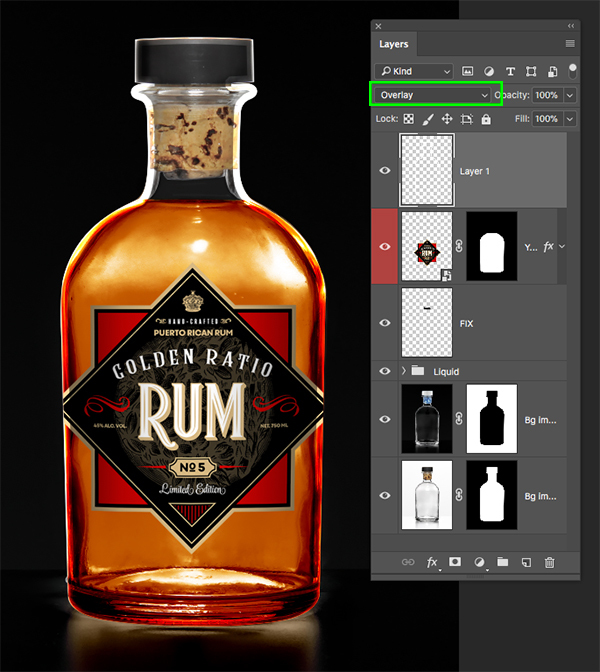 Your label should now only be visible inside of the bottle making it look like it is wrapping around. 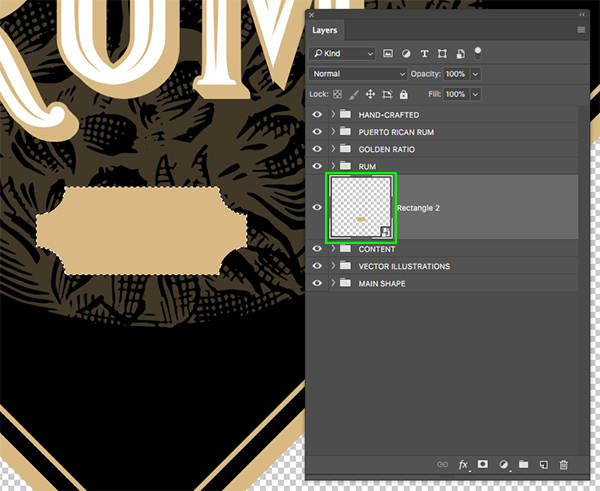 Select the ‘Bg image’ layer and then press ‘P’ to switch to your Pen Tool. 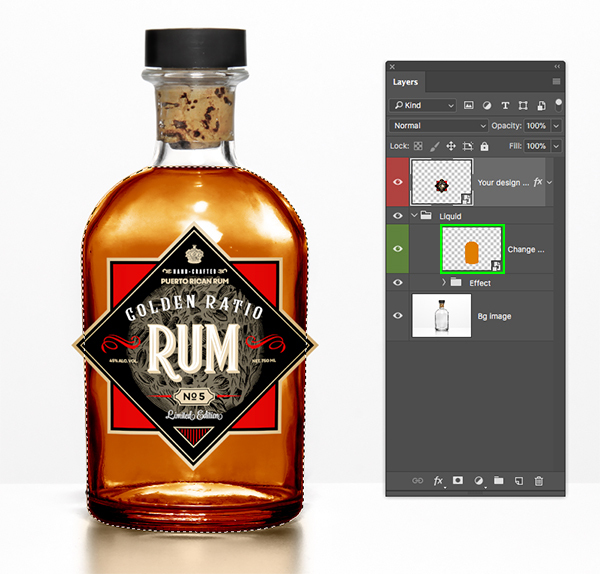 From here we will zoom in by pressing Command/Ctrl and the ‘+’ key and then we will begin to trace around the shape of the bottle. Click to make your first point with the pen and then click and hold when you create your second point. Without releasing the mouse you can move it around to change the curve and direction of the path. After each point, hold the Alt/Option Key and click on the point to reset it so that your next point will go where you want it to. 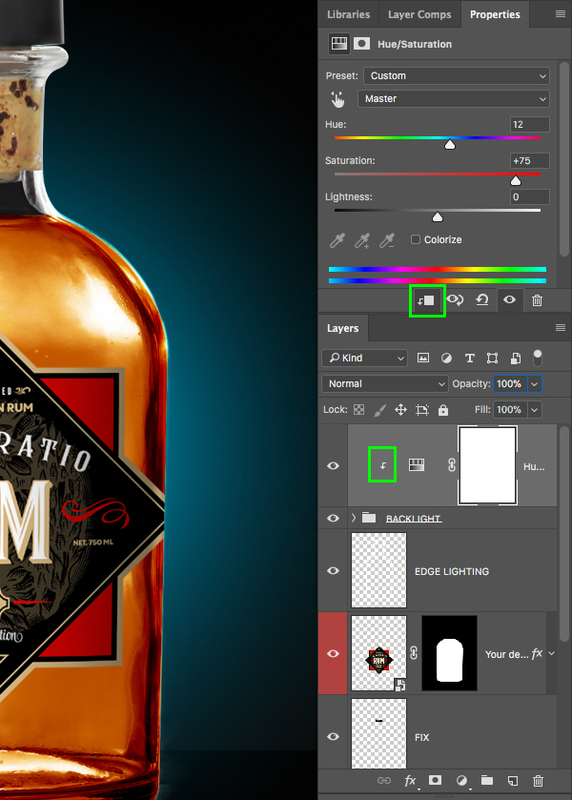 Certain parts may be a little bit trickier such as the area around the cap, but you can get some good practice here with the Pen Tool (P) while tracing. Another handy tip is holding the Alt/Option Key and then clicking on the ends of the handles that extend off of the points so you can modify the path. 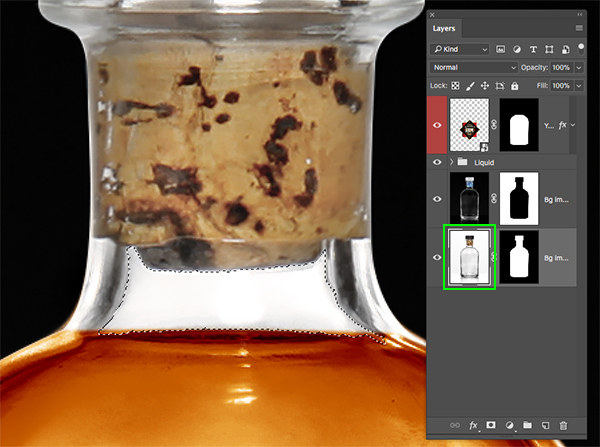 Once you have traced around the shape of the bottle, press Command/Ctrl+Return on the keyboard to activate a selection around it. 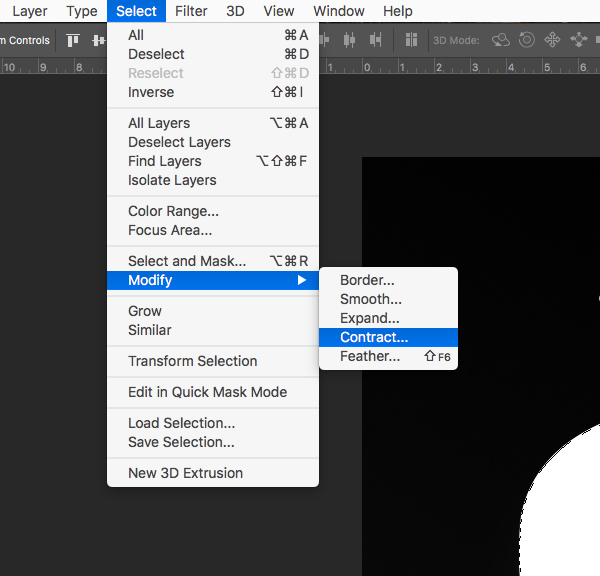 While your selection is still active, click the ‘Add Layer Mask’ icon at the bottom of the Layers Palette to create a mask. 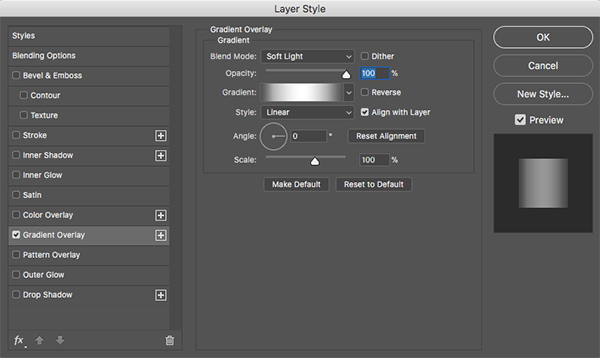 Let’s press Command/Ctrl+J to duplicate the ‘Bg image’ layer and then hold the Control Key and select the Layer Mask and choose ‘Delete Layer Mask’ from this duplicate layer. 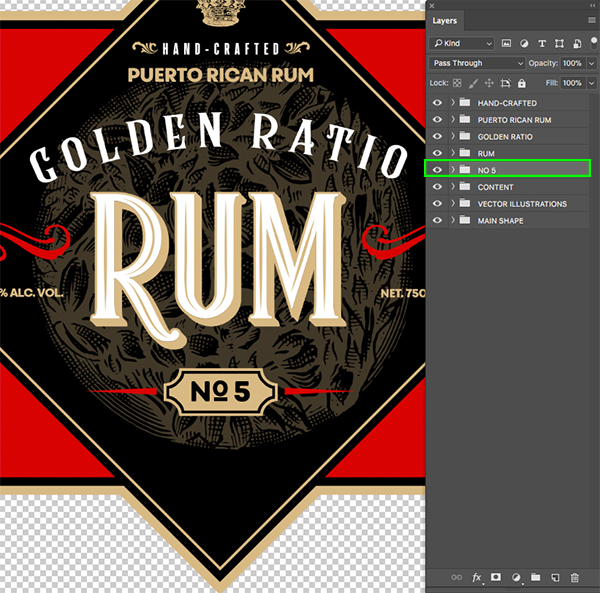 Hold the Command/Ctrl Key and click on the layer mask thumbnail icon from the bottom ‘Bg image’ layer to activate a selection around it and then select the layer above that no longer has a mask applied. 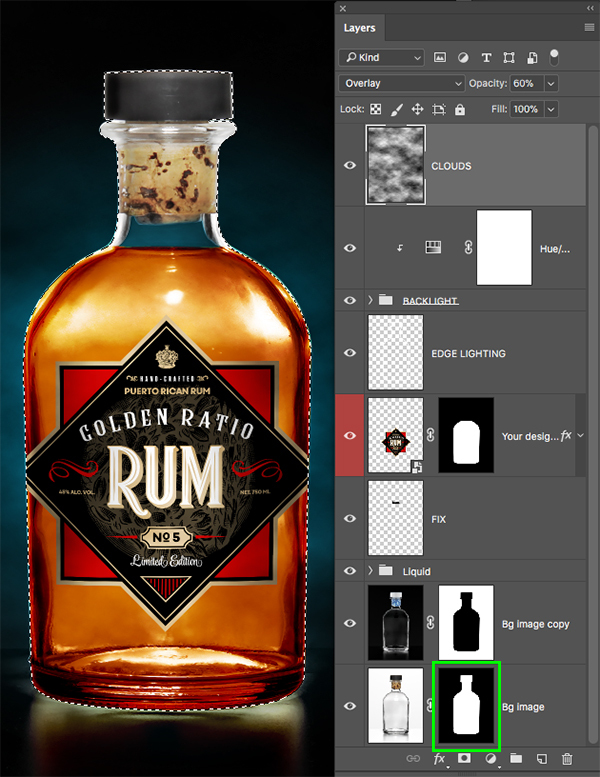 This will activate a selection of the bottle on the duplicate layer. 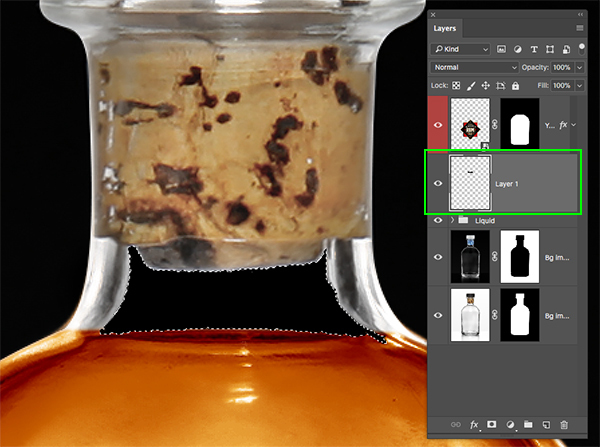 Select the bottom ‘Bg image’ layer and then click inside the white part of the bottle between the cork and the liquid to make a selection. 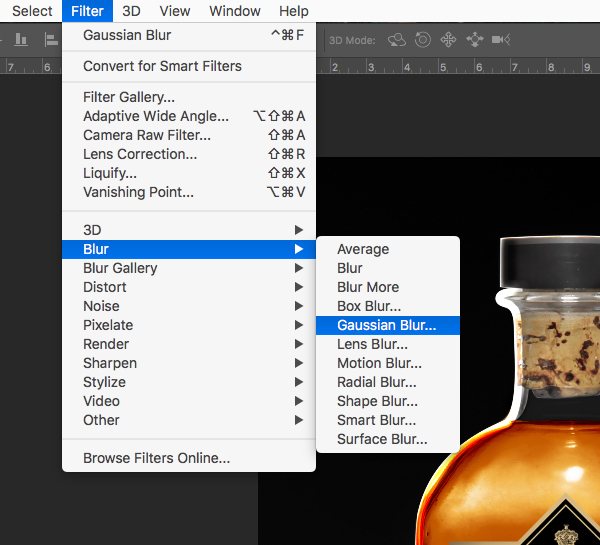 Hold the Shift Key to select additional white areas in the middle until you have most of it selected. If you accidentally select the liquid or another unwanted area you can simply press Command/Ctrl+Z to undo it and then keep going. After you’ve selected the white space in here you should have an active selection. 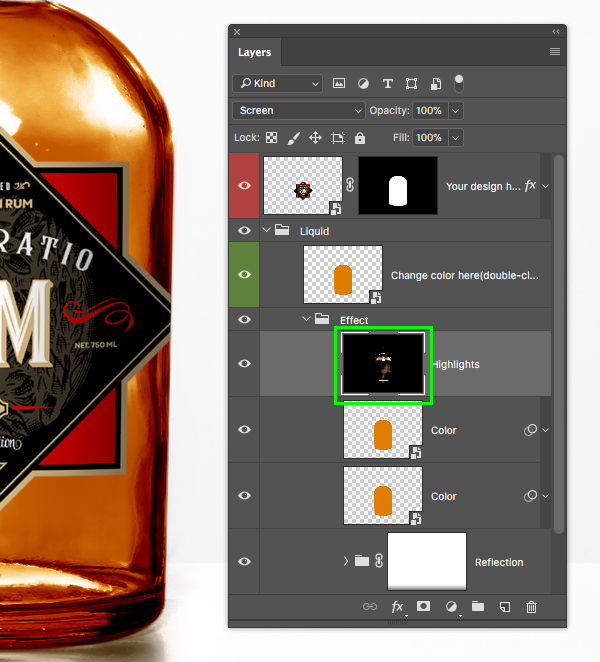 Add a new layer just below the label art and then press ‘D’ to get your default colors. 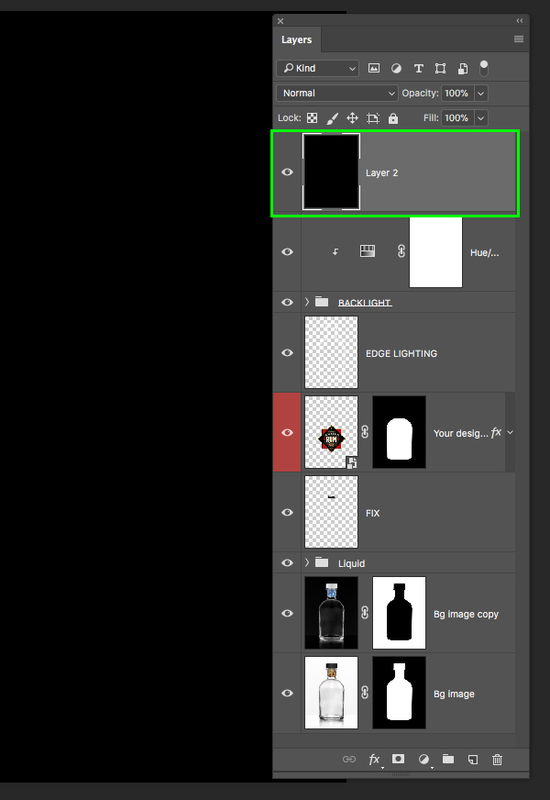 Press the ‘X’ key to toggle between them until black is the foreground color and then press Alt/Option+Delete on the keyboard to fill your selection with solid black. Set the ‘Radius’ to about ‘5’ and then press ‘OK’ to apply the effect. If you still have some white edges after doing this you can go in with a soft round brush and manually paint over those areas just to clean up the edges a bit more and tidy things up. Once you have done that, press ‘9’ on the keyboard to lower the opacity to ’90%’ so that the shape isn’t completely black. 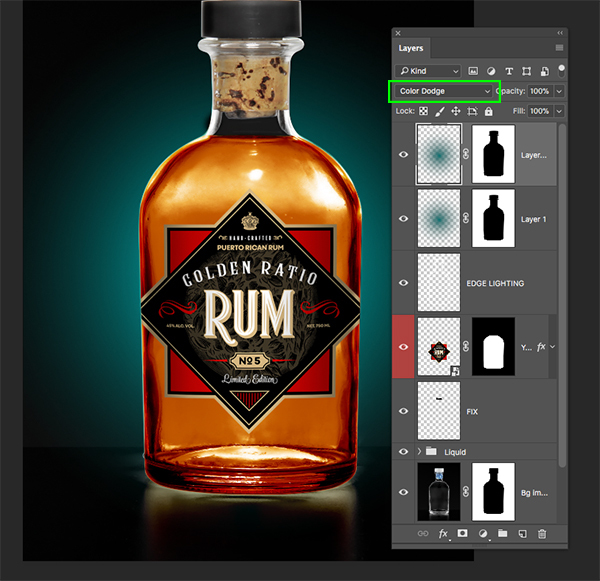 Create a new layer at the top of your Layers Palette and then hold the Command/Ctrl Key and click on the layer mask thumbnail of the ‘Bg image’ layer at the very bottom. 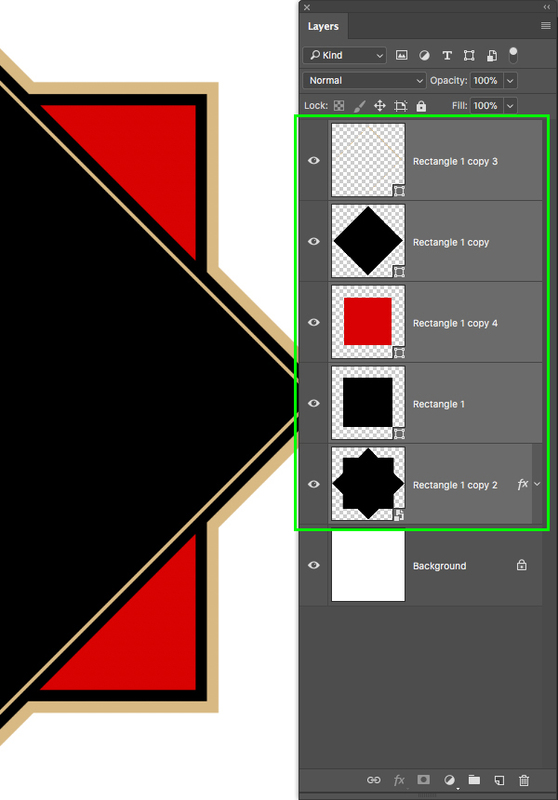 With your new layer selected and your action still active, press ‘X’ to toggle your default colors so that you now have white as your foreground color and then press Alt/Option+Delete to fill the new layer. 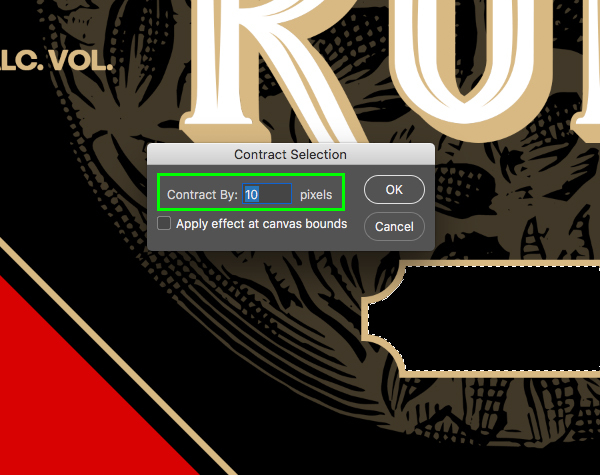 Choose a contract setting of ’15’ and then press ‘OK’ to contract the selection. 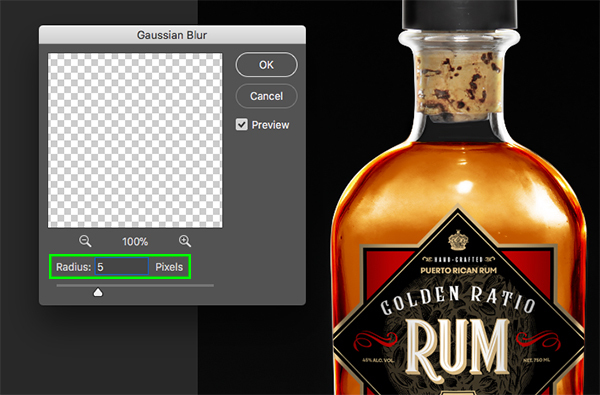 Go to the Filter Menu and once again choose ‘Blur > Gaussian Blur…’ like before. Now we can leave our settings the same as before since it should still be set to a ‘Radius’ of ‘5’ and then hit ‘OK’ to apply the effect once again. We will now lower the opacity of the edge lighting to about ’50%’ by either manually moving the slider or by pressing the number ‘5’ on the keyboard. 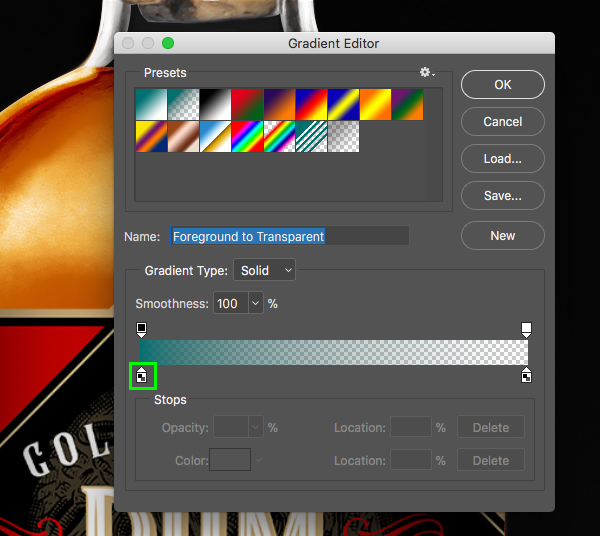 If you open the ‘Gradient Editor’ you can then have control over the colors as well as the transparency of your gradient. 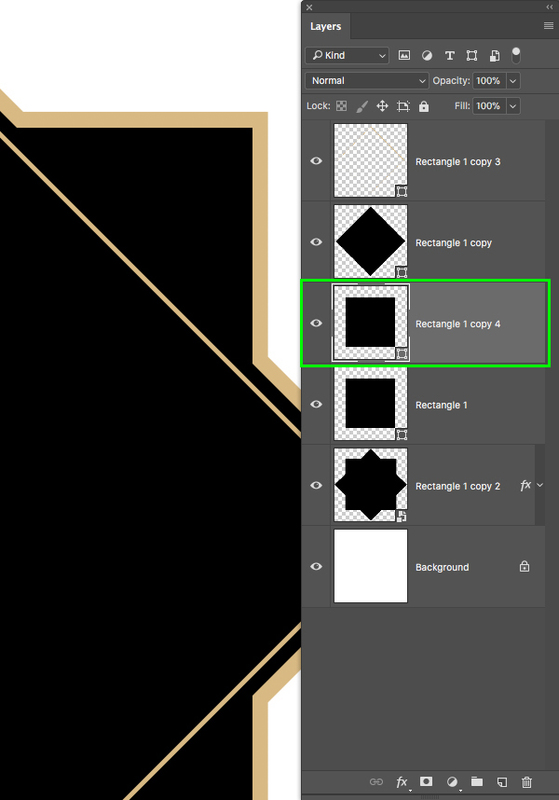 The small box highlighted in the image below is the box you can click to modify the fill color of the left side of your gradient. Let’s click on this to change the fill color. 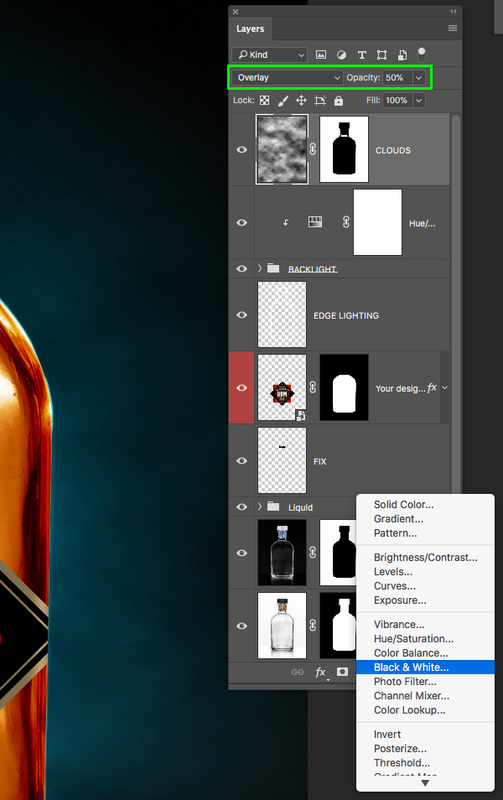 Change the fill to the hex value ‘#007070’ and then click ‘OK’ to close out of the panel. Now if we select the box on the lower right of our slider in the editor we can change the ‘Opacity’ to ‘0’ so that we get a fade that goes from our solid blue-green into the background. 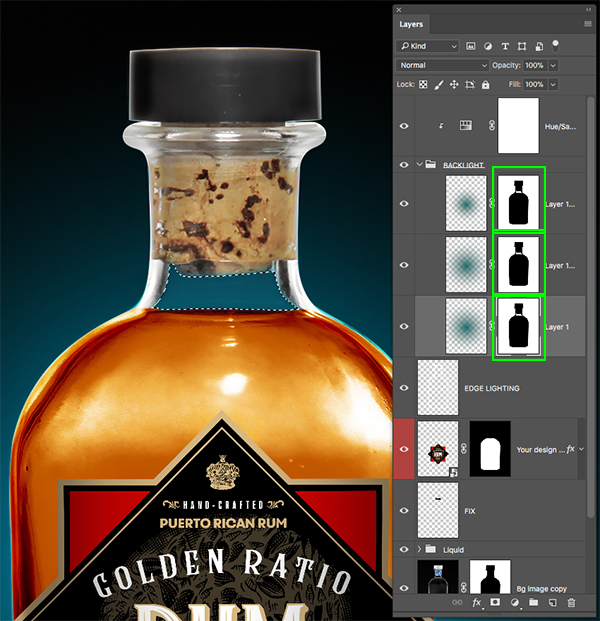 Hold the Command/Ctrl Key and click on the layer mask thumbnail icon of the inverted ‘Bg image’ layer to activate a selection around everything outside of the bottle shape. 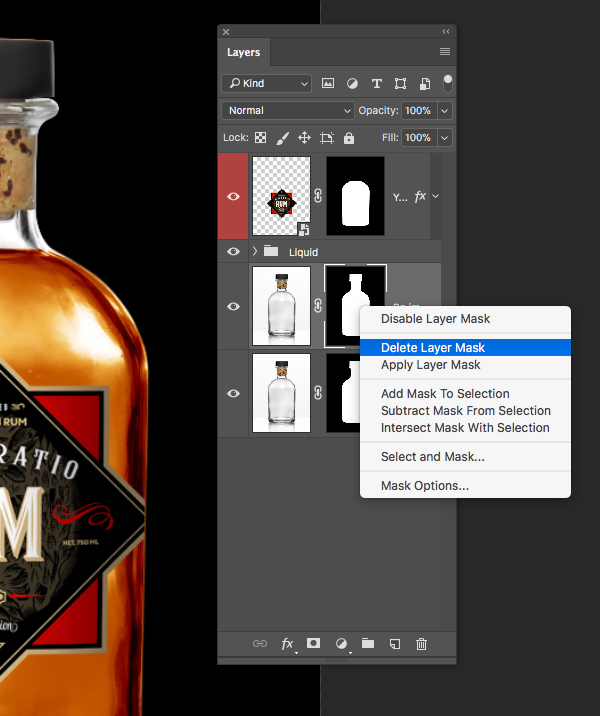 While the selection is active, click on the ‘Add Layer Mask’ icon. 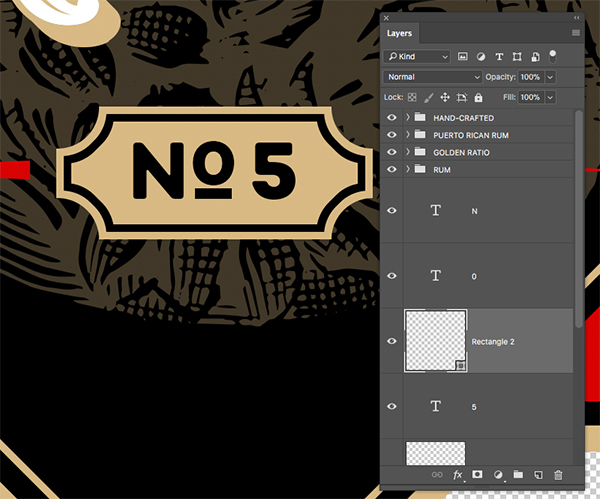 Duplicate the layer once more and then change the ‘Opacity’ to ’50%’ by pressing the number ‘5’ on your keyboard. 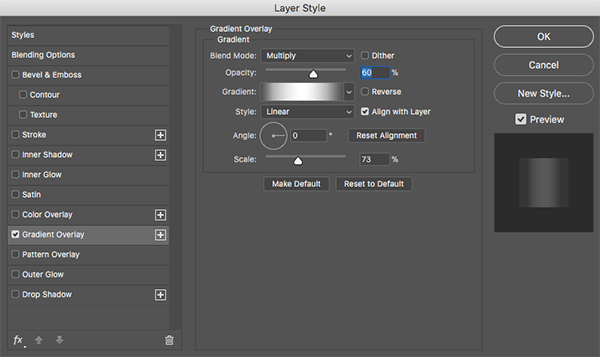 Select the top copy of the gradient in your Layers Palette, then hold the Shift Key and select the third. Press Command/Ctrl+G to place these three layers into a group and change the name of the folder to ‘BACKLIGHT’. 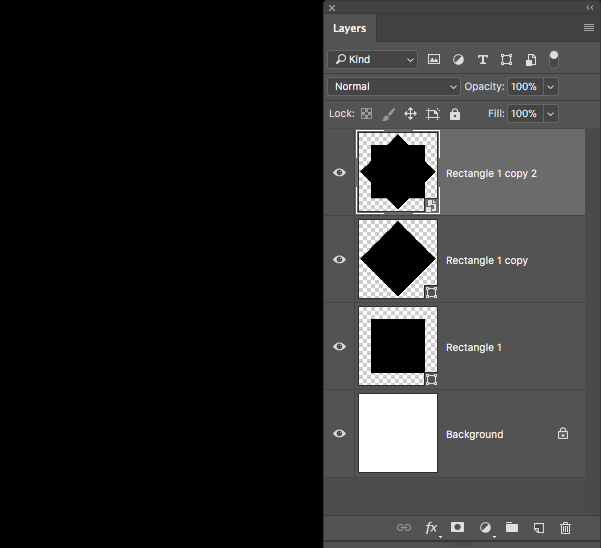 Next, hold the Alt/Option Key and click on the Adjustment Layer icon in the bottom of the Layers Palette – it’s the one that looks like a black and white circle next to the mask icon. You should now be prompted with a dialog box where you want to check off ‘Use Previous Layer to Create Clipping Mask’ and then click ‘OK’ or press the ‘Return’ key to apply the changes. 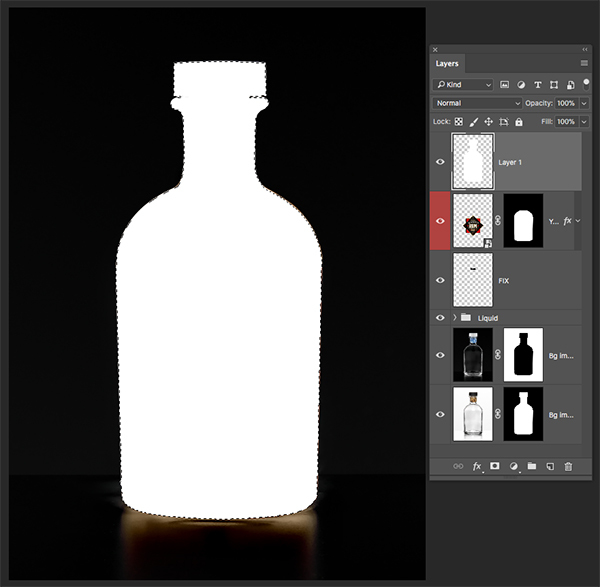 Select the ‘BACKLIGHT’ folder and then reduce the opacity slightly – somewhere around ’90%’ looks good. 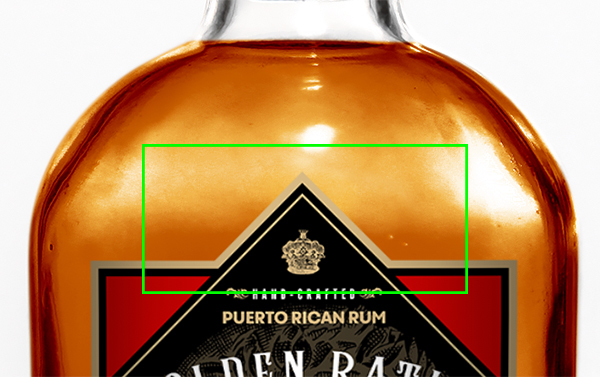 When I am zoomed in I noticed that the label is actually appearing a bit blurry, so I want to quickly show you how to fix this if you are experiencing the same thing. 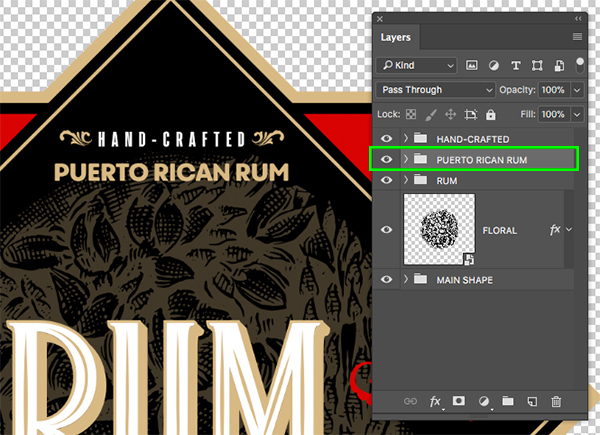 What we need to do is double click the label Smart Object layer to open the artwork in a new window. 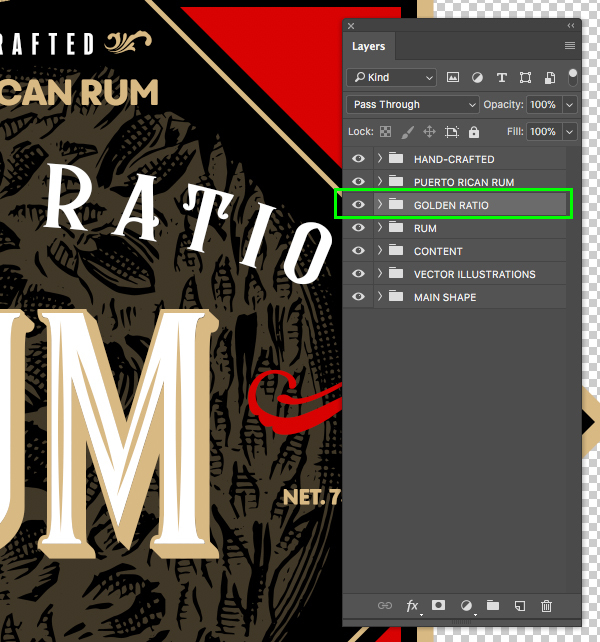 Once you are in the main label artwork file go to the ‘Image’ and then ‘Image Size…’ from the menu up top. Now we need to change the measurement to ‘Percent’ and type in about 400%. 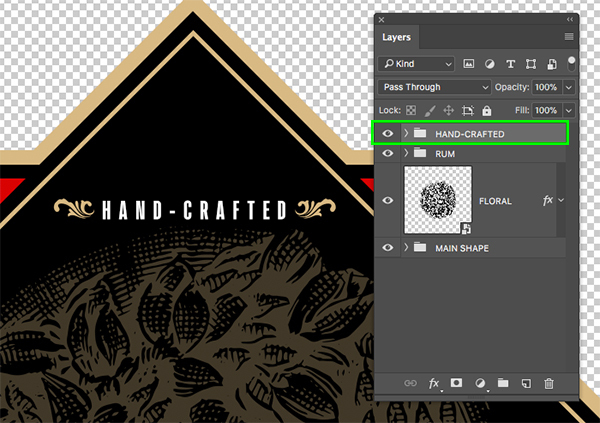 Doing this will allow our label artwork to become 400% percent larger inside of the file, which will result in a sharper appearance in the mockup. 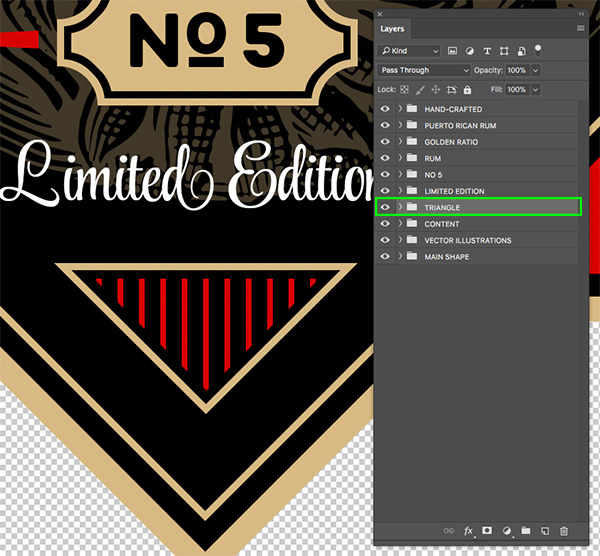 Once you have made these changes, press ‘Return’ or click ‘OK’ and then save the file by pressing Command/Ctrl+S. Now we just close out of this window or tab using the shortcut Command/Ctrl+W. 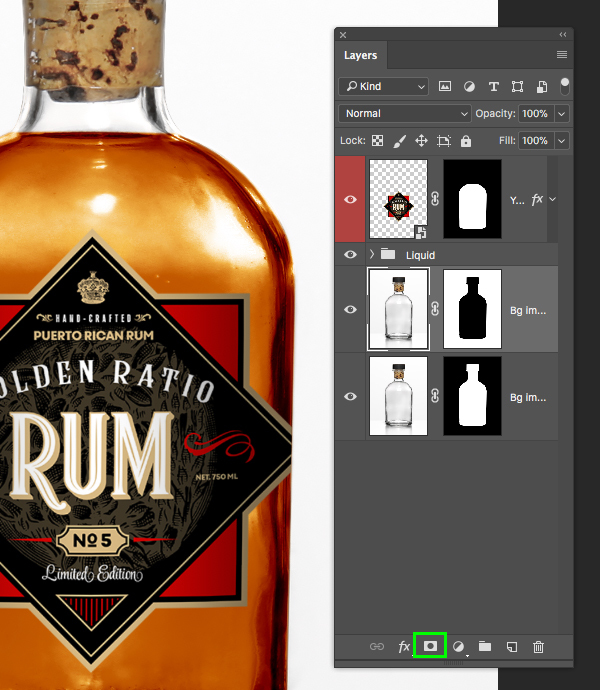 After making that adjustment let’s zoom back in and you should see a noticeable improvement in the quality and sharpness of the label. 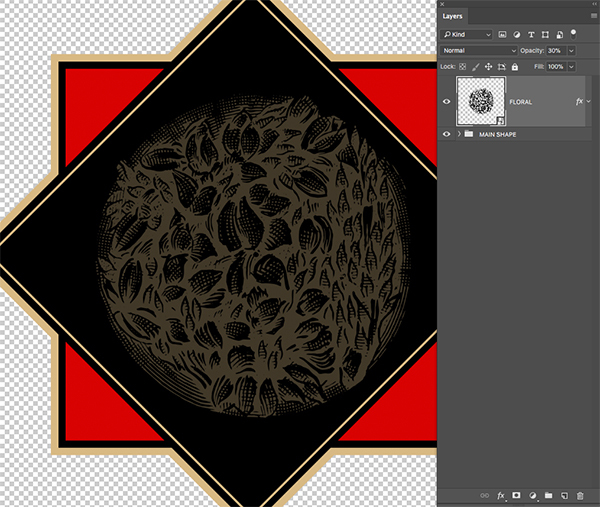 It’s times like these I am glad that we made the artwork a Smart Object so that we can bring it back closer to it’s original size of 8.5” x 8.5”. 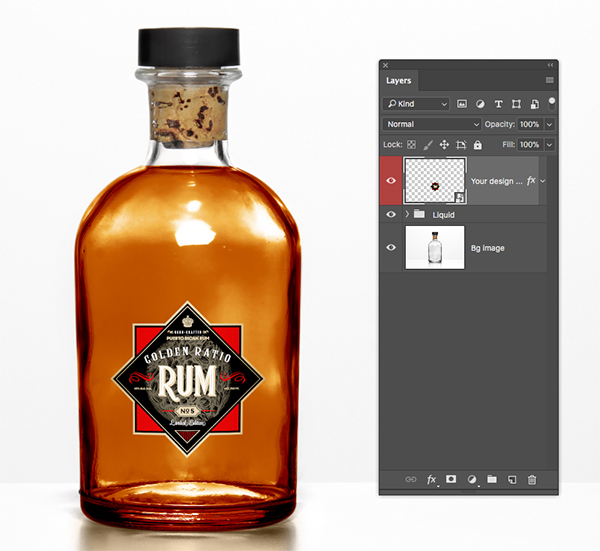 If we didn’t make our label a Smart Object when we first dropped it in we may not have been able to return to a less pixelated image so that is a quick fix! 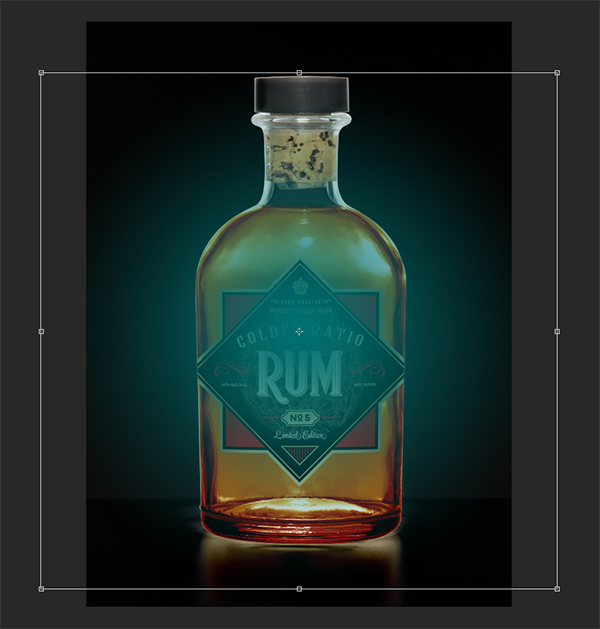 One other adjustment we will need to make on our design is to allow the backlight to show through the area that we fixed on the neck of the bottle from earlier. 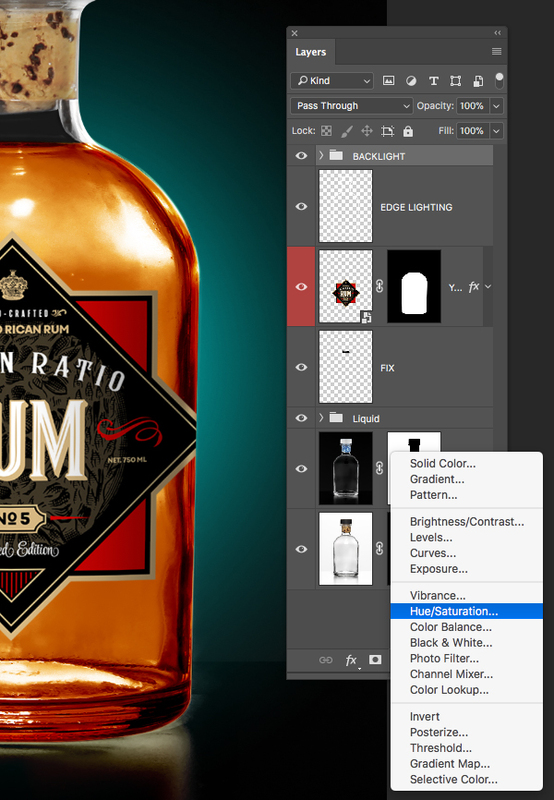 At the moment when we look through it we see mostly black rather than seeing the color from the gradient. 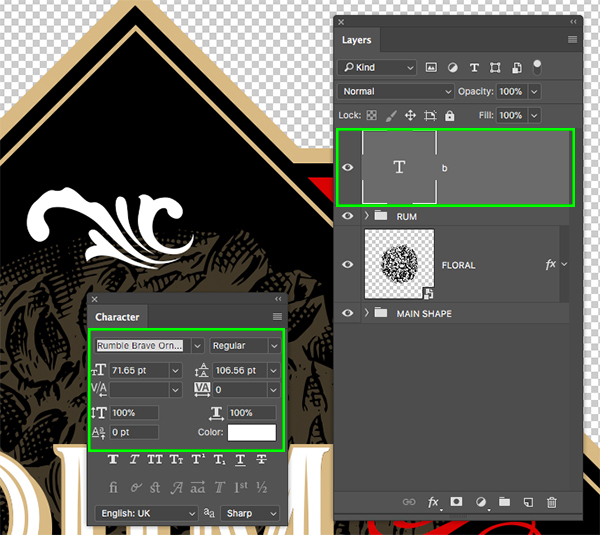 To fix this, lets first hold the Command/Ctrl Key and then click on the layer thumbnail icon of the ‘FIX’ layer to activate a selection around it. 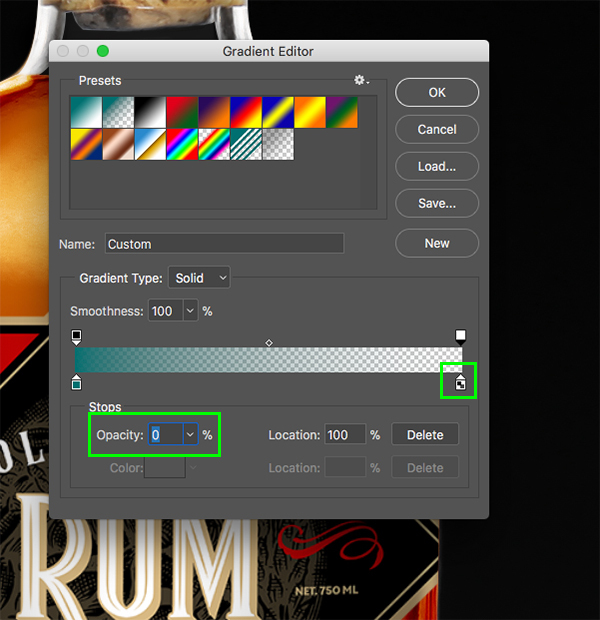 Next, expand the ‘BACKLIGHT’ folder to reveal the three gradients inside. 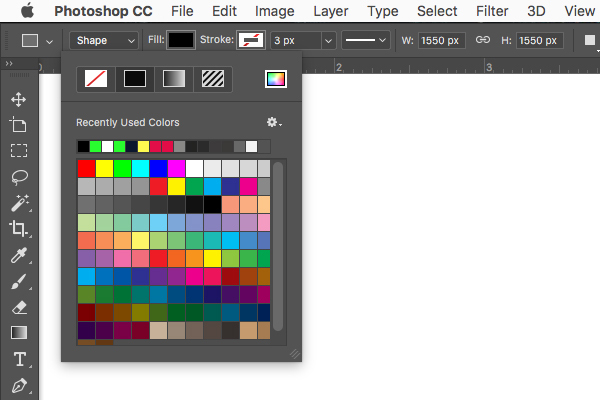 Make sure that you have a solid white foreground color and then select the mask that is attached to each of the gradients and press Alt/Option+Delete on the keyboard and that will fill the mask with white, revealing the gradient layers. 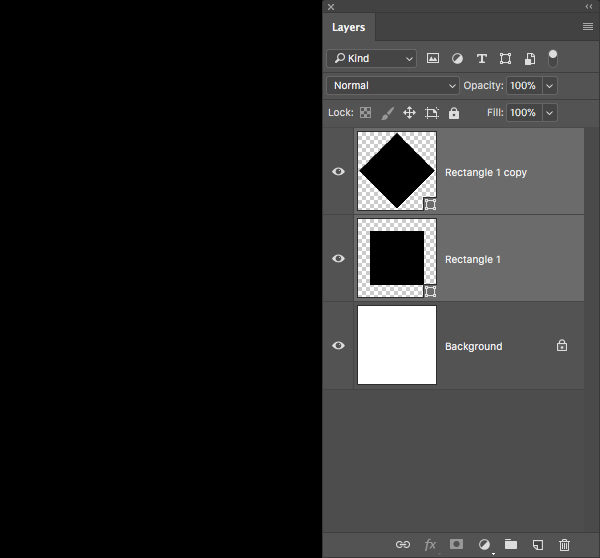 Create a new layer at the top of the Layers Palette and then press ‘D’ to revert to your default colors of black and white. 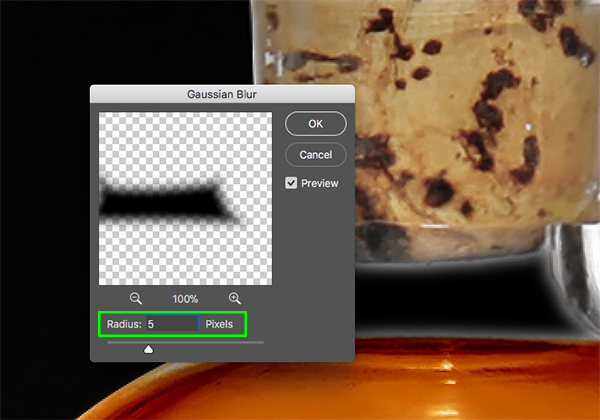 Tap the ‘X’ key to toggle between the foreground and background colors until black is the foreground color. 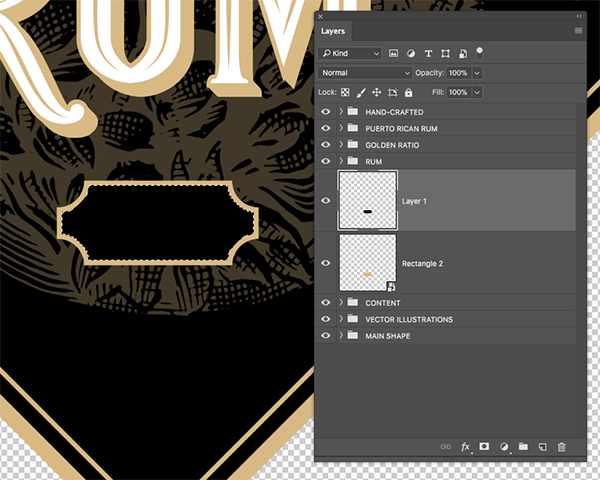 Next, press Alt/Option+Delete on the keyboard to fill the layer with black. 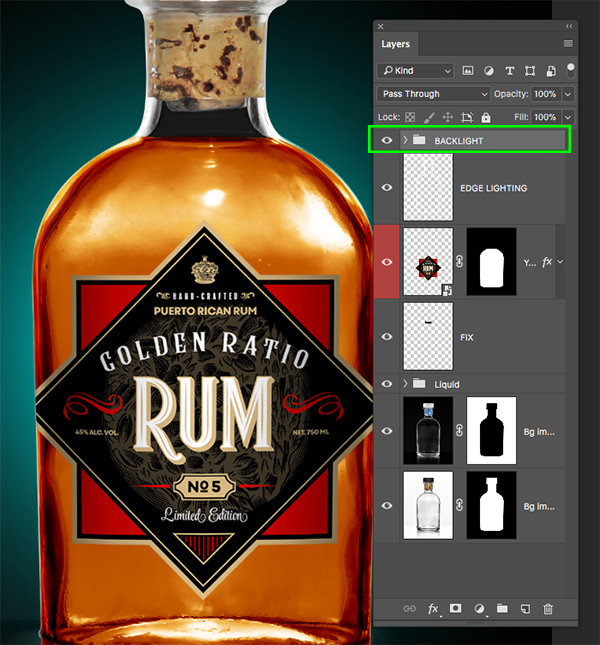 After applying the effect, change the Blend Mode of the layer to ‘Overlay’ and reduce the opacity to about ’60%’. 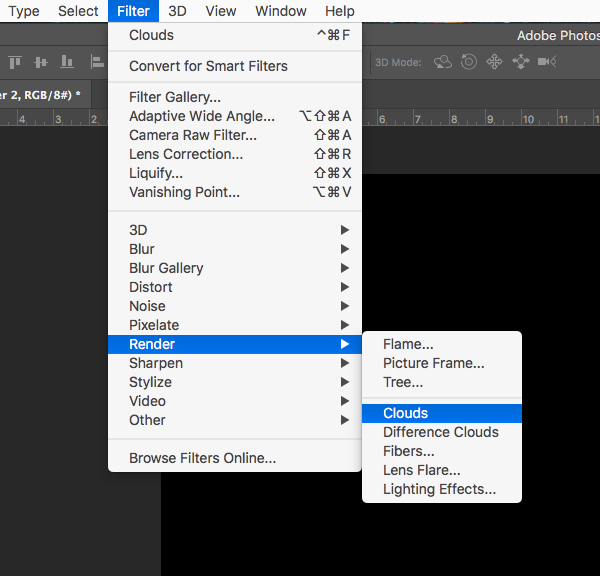 Select the cloud layer and press Command/Ctrl+T to initiate a Free Transform and then drag either the left or right handle of the bounding box outwards while also holding the Alt/Option+Shift keys so that it extends out to the sides evenly. 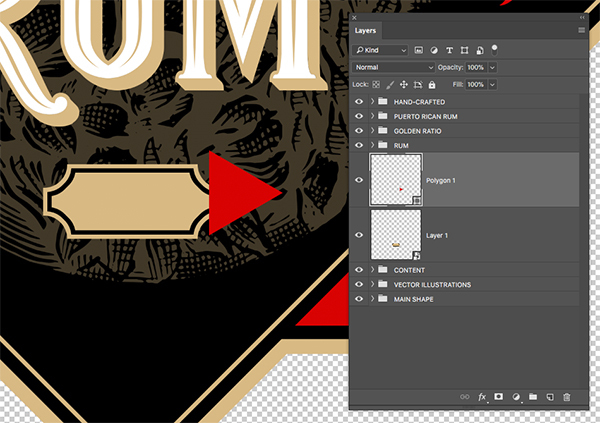 Once you’ve stretched the texture out a bit wider press the ‘Return’ key to apply the changes. Hold the Command/Ctrl Key and click on the layer mask thumbnail icon from the bottom ‘Bg image’ layer. After that, press Command/Ctrl+Shift+I on the keyboard to inverse the selection and then add a mask by clicking the ‘Add Layer Mask’ icon from the bottom of the Layers Palette. 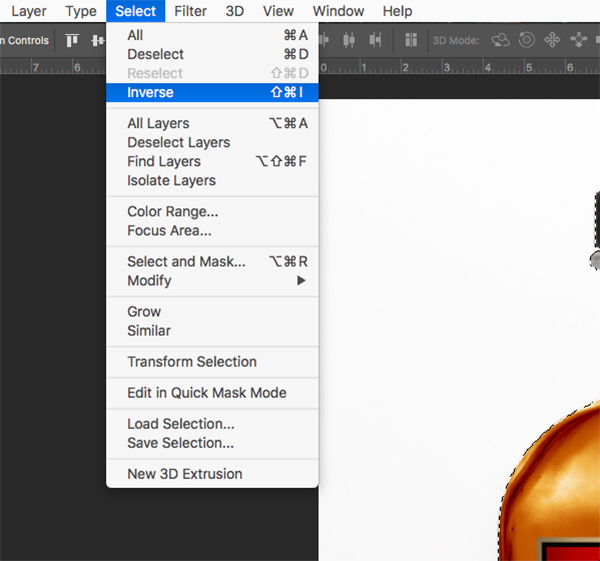 Hold the Command/Ctrl Key and now click on the layer thumbnail icon (not the layer mask thumbnail icon) of the ‘FIX’ layer to activate a selection around it. 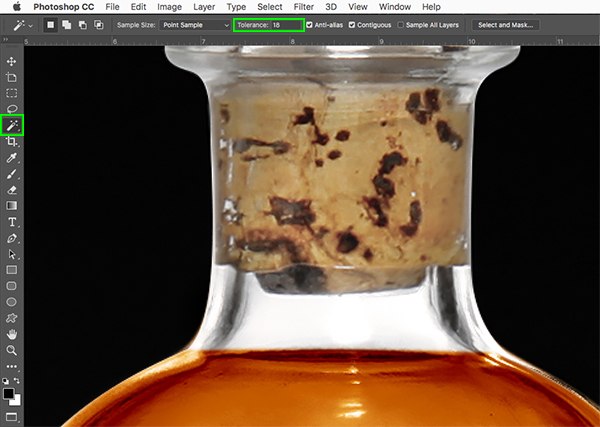 Once you have an active selection around the shape inside of the bottle neck, select the ‘CLOUDS’ layer and then click on the mask to select it. 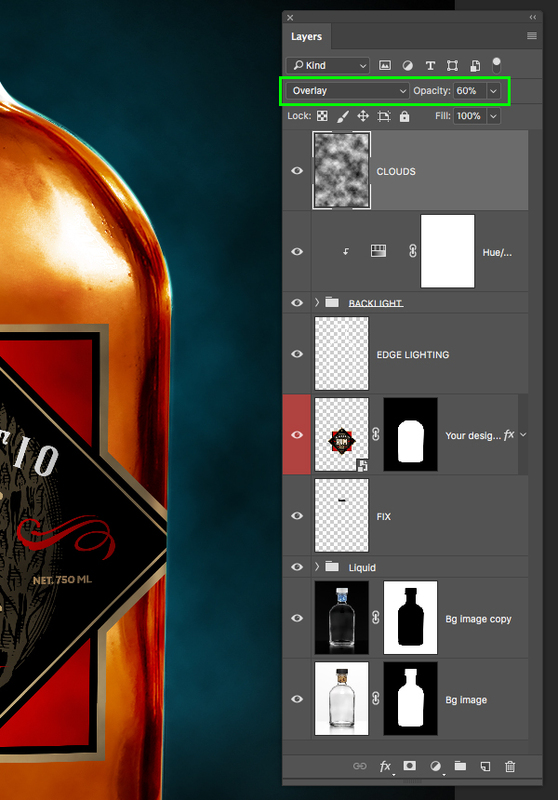 Make sure that your foreground color is set to solid white and then press Alt/Option+Delete on the keyboard to knock this shape out, revealing the clouds through the middle of the bottle. After applying the Adjustment Layer, change the Blend Mode to ‘Soft Light’ and reduce the opacity to ’20%’ to add a bit more contrast and we are done! 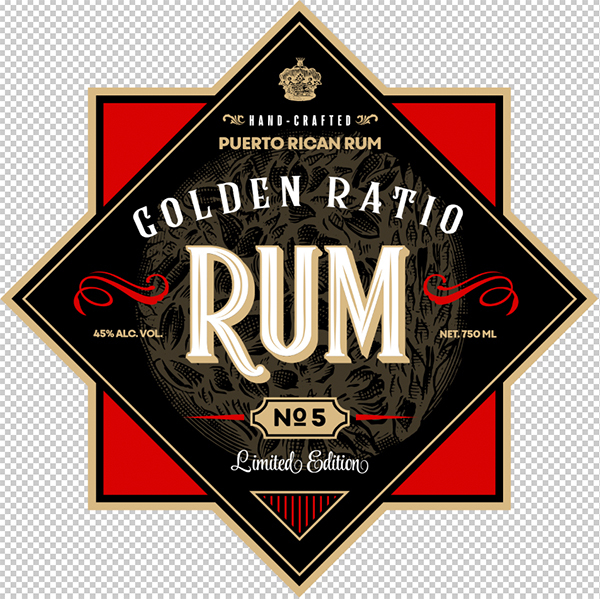 This now concludes our Golden Ratio Rum Design! I hope that you have enjoyed this tutorial and found some useful tips and techniques along the way. 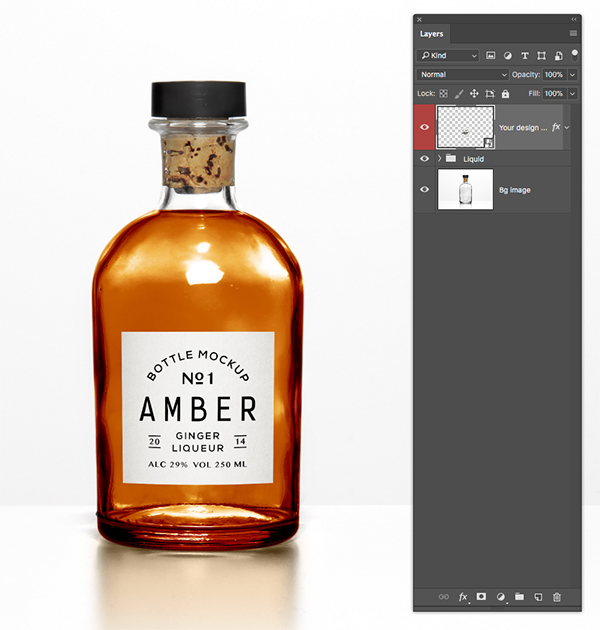 We created a unique and interesting label design using some of Photoshop’s built in shape tools along with a handful of best-selling font families from The Complete, Quality Font Collection. In addition to the assets that we have used to create our design, there are so many more typefaces available in the full bundle that are a must have for any font lover. We can’t wait to see what you come up with using these assets and the techniques we have covered in the tutorial! There’s still time to check out The Complete, Quality Font Collection where you’ll discover a range of the world’s most popular fonts for a massive 99% discount! Thank you very much for updating me with your comment but there is somewhere am stuck.As in i can’t practically do what you did.When creating the MAIN SHAPE,I din’t get it when you said that “…then click on the merged smart object shape at the bottom so that…” HOW is it really done?I can’t do it. Thank you so much for reaching out to us and I am so sorry to hear that you are having difficulty following along with this one! 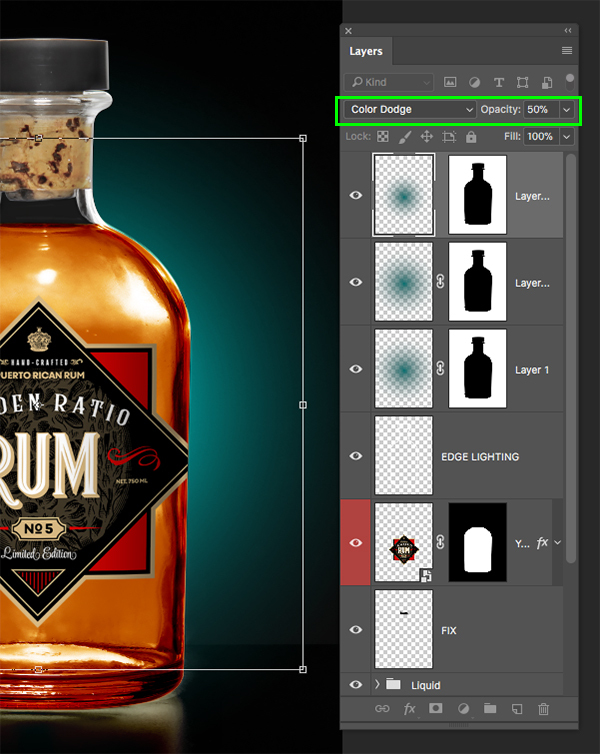 Amazing tutorial about how to create a rum label design in photoshop. Thank you for taking the time to create and post. Excellent post. I have been using this s/w for decades, and still learned a few thongs! I agree with Lois that the live fonts were useful. Another great tutorial from Eric – in the video, he gave the single best description of using the Pen tool I have seen. Thank you! Thank you so much for commenting. We’re so happy that you also found using the actual fonts in the tutorial useful 🙂 Eric is always fantastic to work with and we loved sharing this tutorial with you, happy designing! We’re so glad you enjoyed the tutorial and thank you so much for taking the time to leave a comment. Happy designing! Where do I find the “ultimate collector bundle”? Where do I find it to download? Only buy it? If yes, where in this site I buy it? Thanks for taking the time to come back to SJ! Another excellent tutorial. 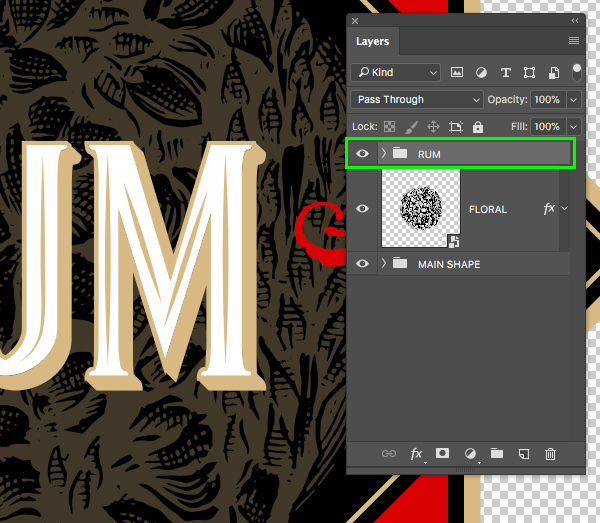 I really appreciated the effort to show in detail how to use the Pen Tool (that mysterious tool that trips us up at first, making us not want to use it and get better with it). There were a lot of other little tips and tricks in here as well. Also, thanks for using live fonts. 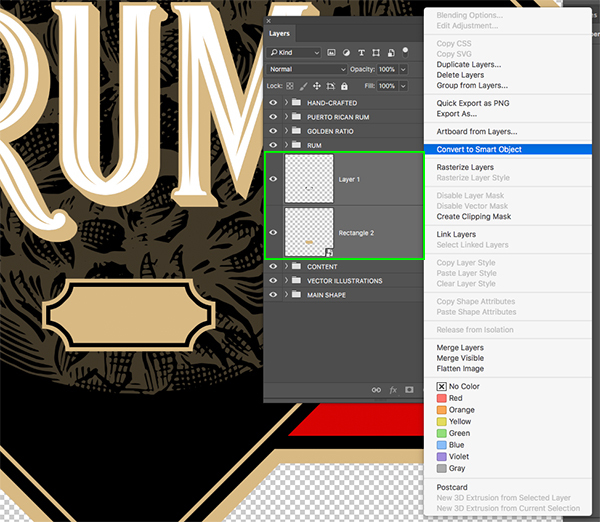 It seems a good way to highlight the bundle fonts, as well as reinforce ways to use them in design such as warping the text and adjusting the tracking, etc. Long-time users probably use these skills daily, but new users benefit from learning them or being reminded of them. Thank you so much for leaving a comment on this tutorial, and for such kind words too! It’s fantastic news that the inclusion of the actual fonts has been helpful and worked well for you too. 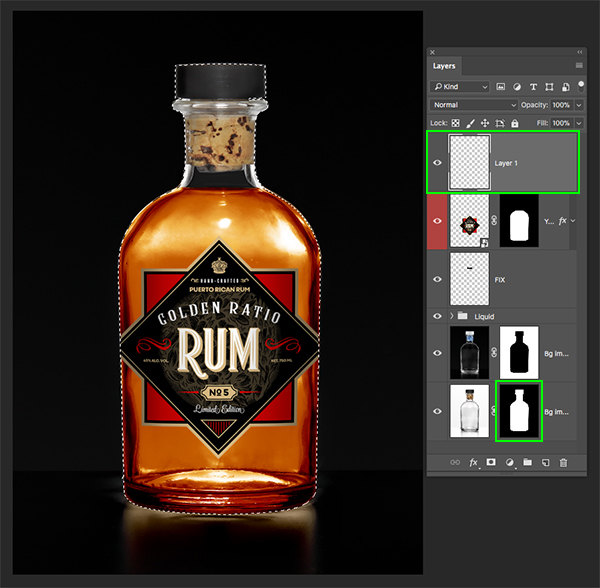 We really love working with Eric, and we were super excited to share this tutorial with you! Your freebie link is linked up to the deal page, not the freebies! Thanks! We’ve had this resolved now, so you should be able to pick up the freebie without any issues and we’re really sorry for any confusion caused. 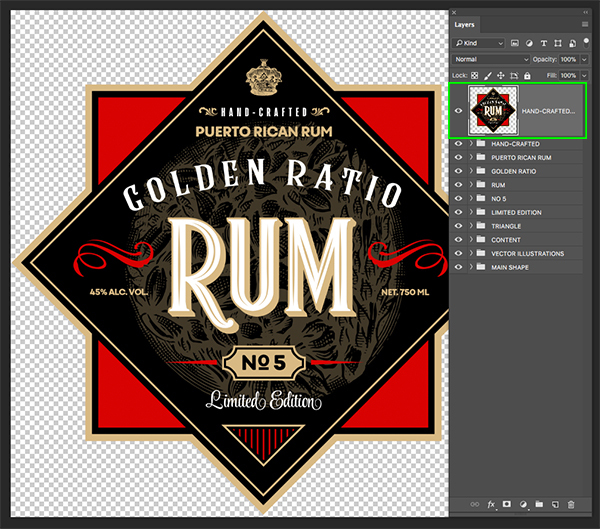 Hello, please, if you are making a label for printing, make it with Illustrator with Pantones solid colors or CMYK for painted illustrations ( so in Photoshop .TIFF CMYK ) and layers for gold foil stamping, emboss and all printing techniques. It’s easier and appropriate. I am so sorry for any disappointment caused. 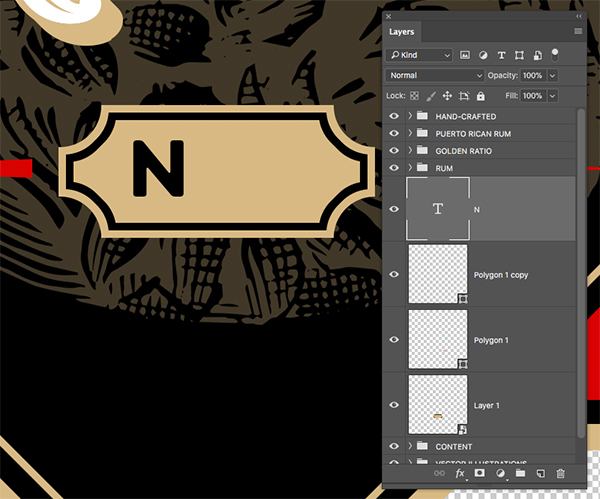 This is just the way Eric has mocked it up for the purpose of this tutorial, as we don’t anticipate this design being printed. The focus of this one it to highlight some of the great fonts in our current bundle- the Complete, Quality Font Collection and to offer inspiration and ways that you could put them to use. We’re also so happy to hear that you love our products and are getting loads of use out of them!